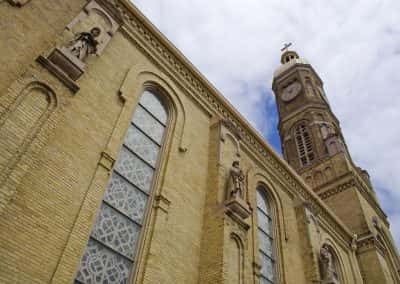 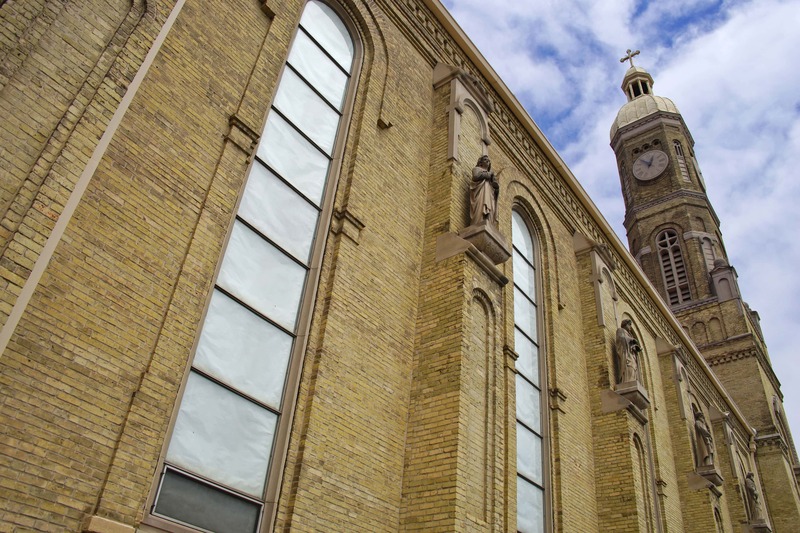 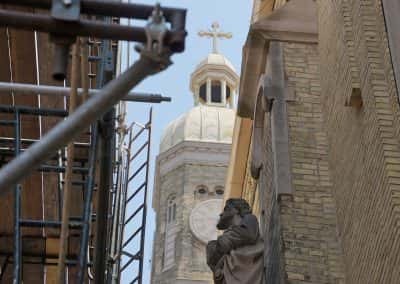 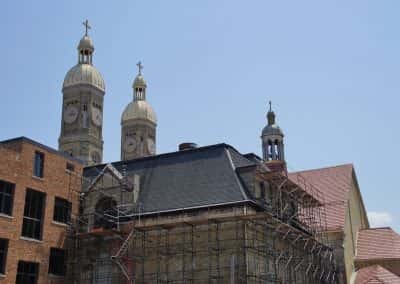 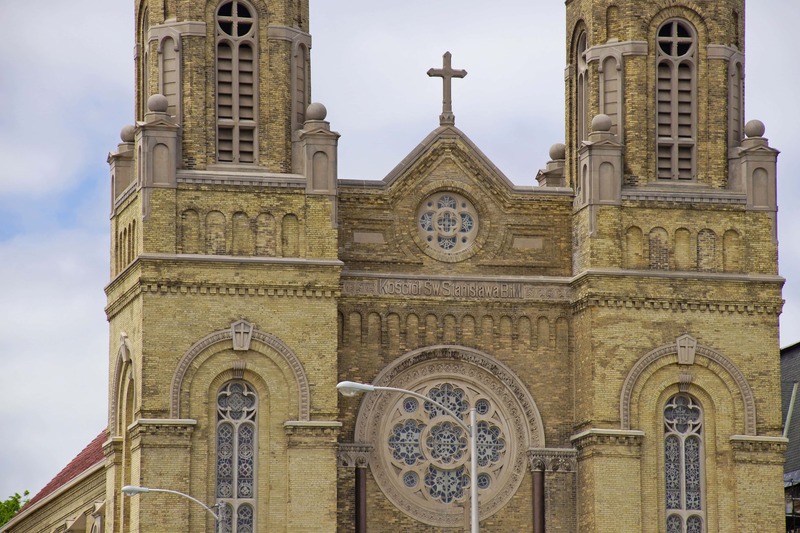 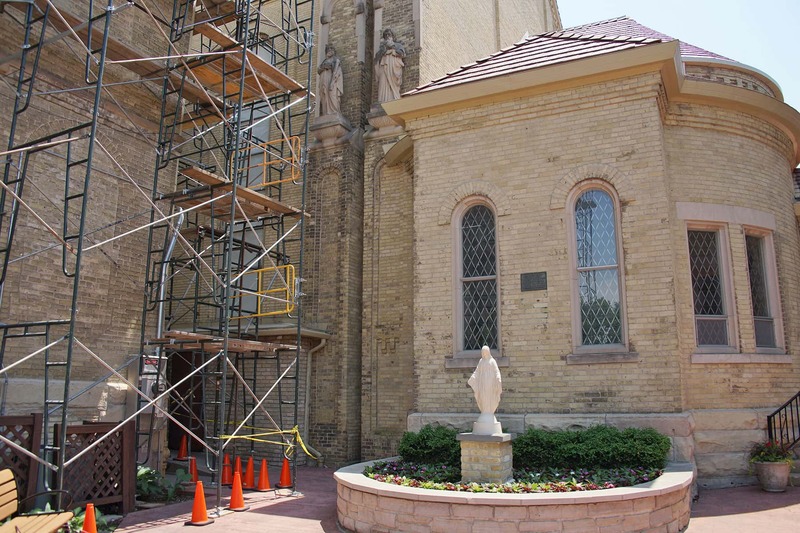 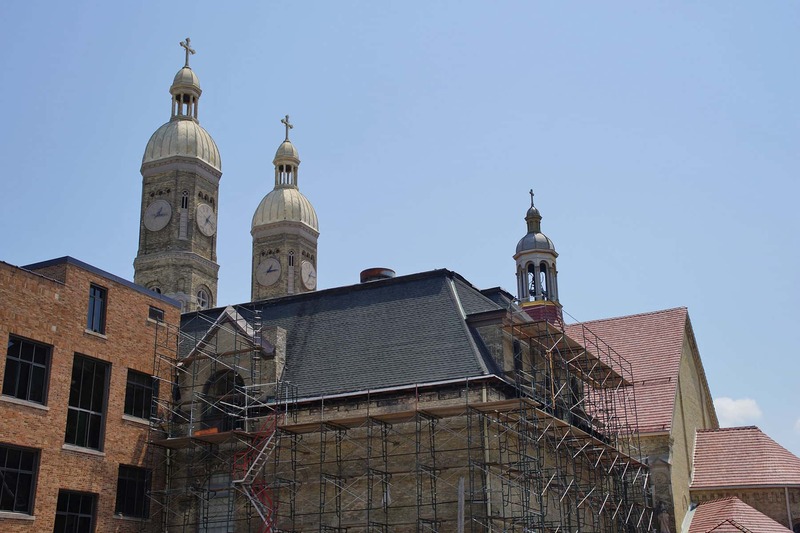 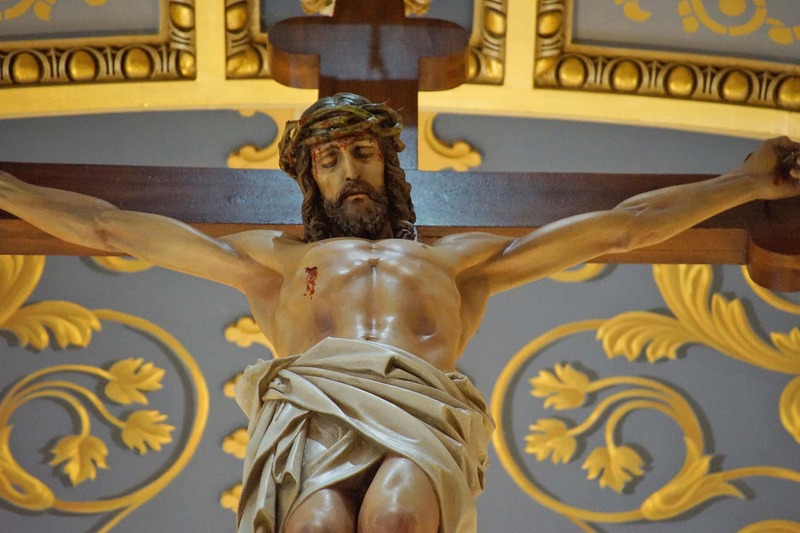 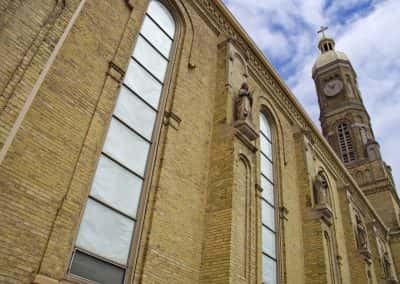 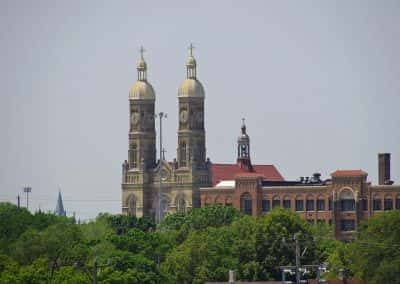 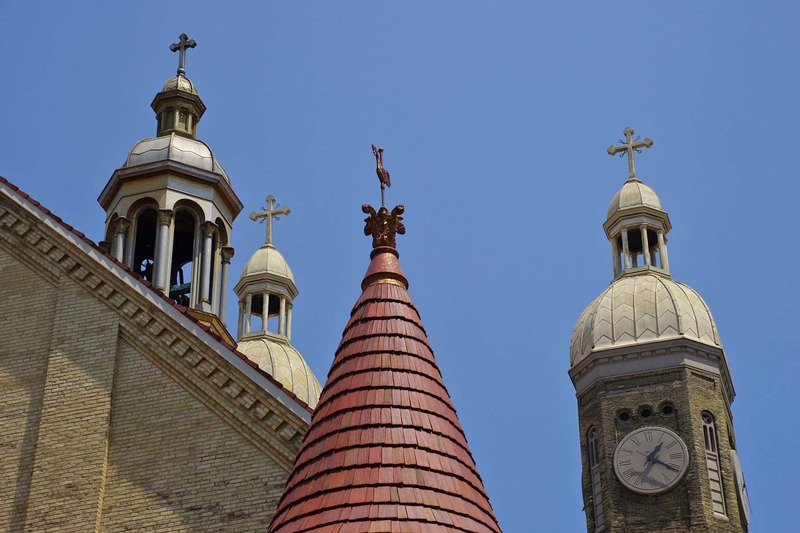 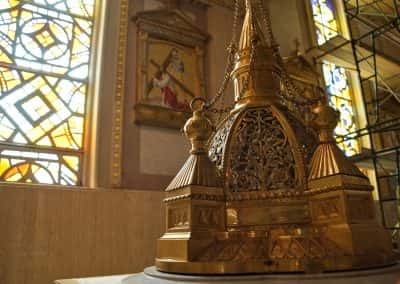 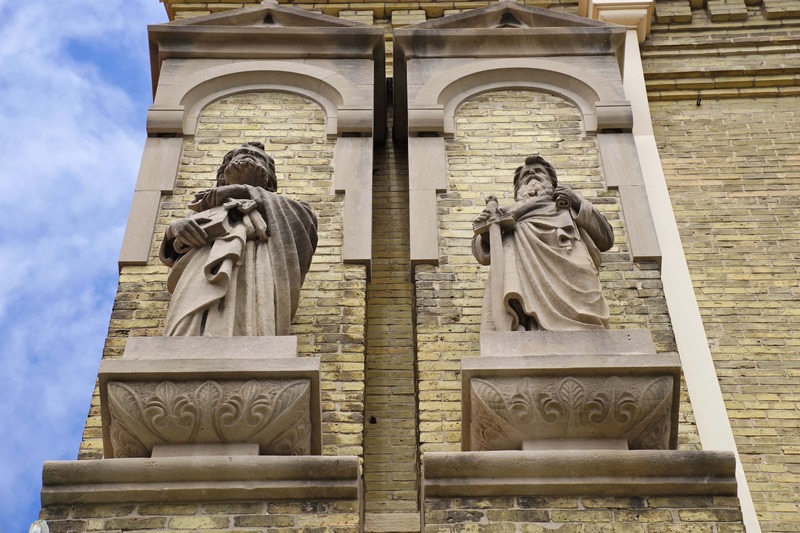 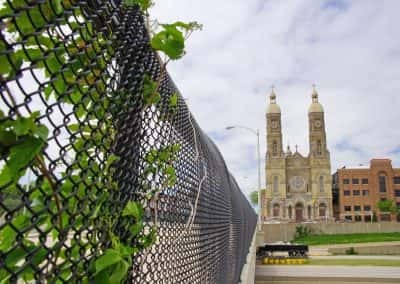 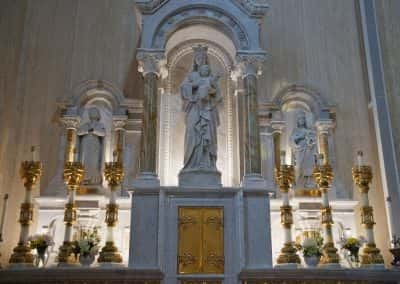 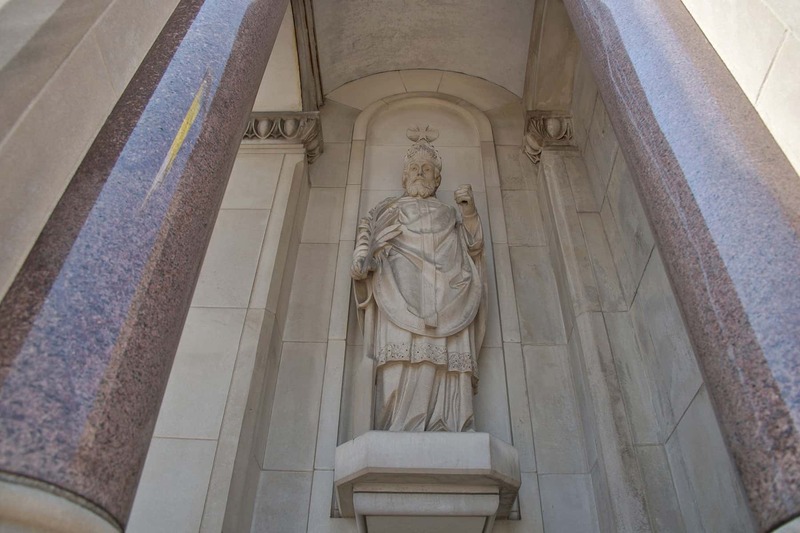 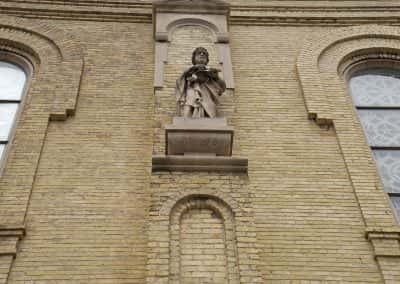 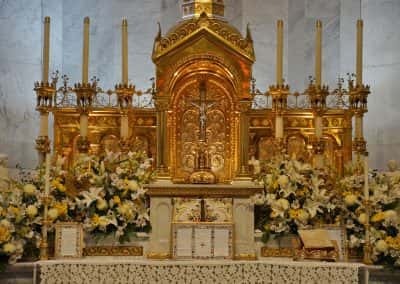 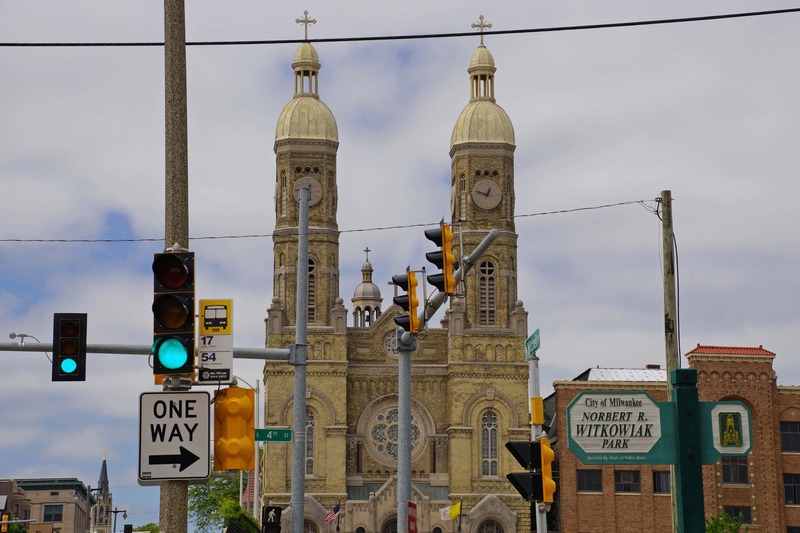 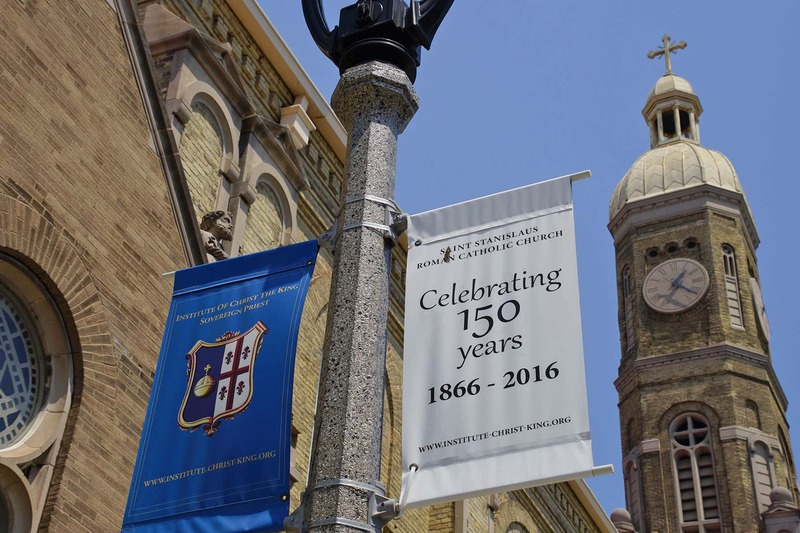 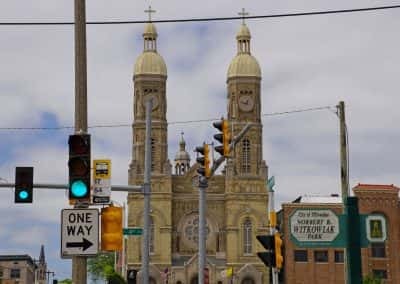 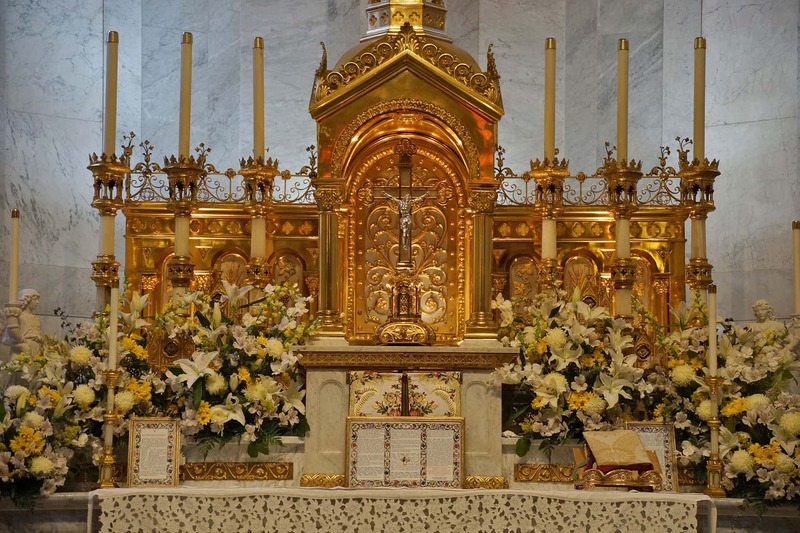 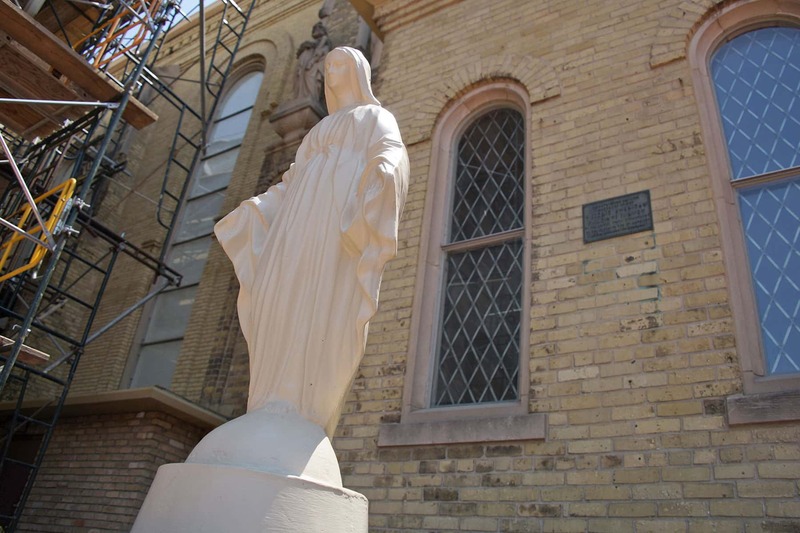 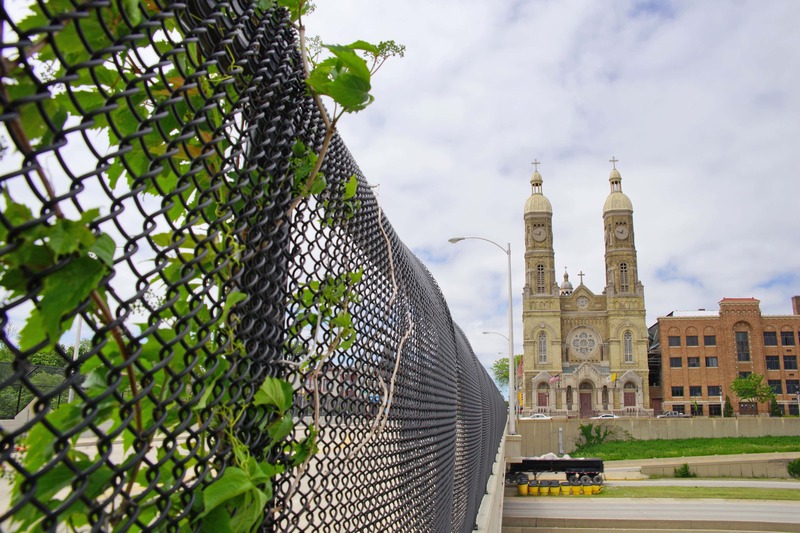 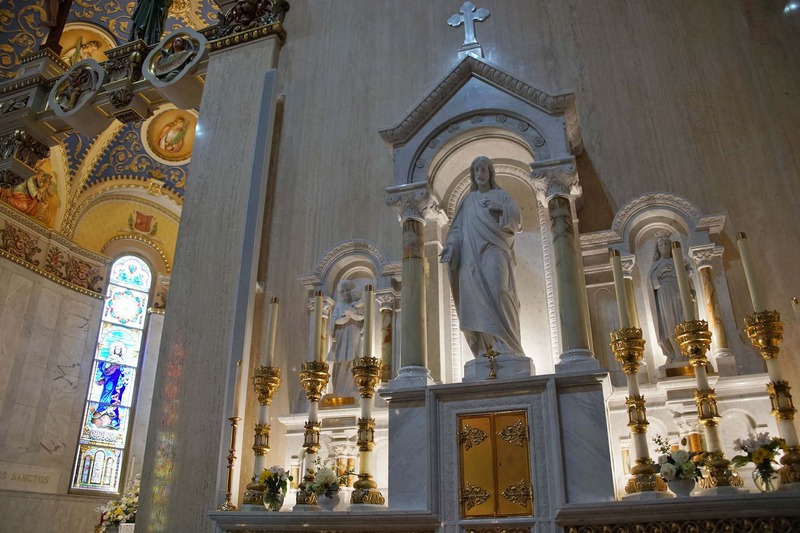 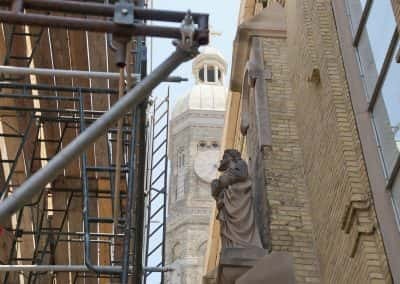 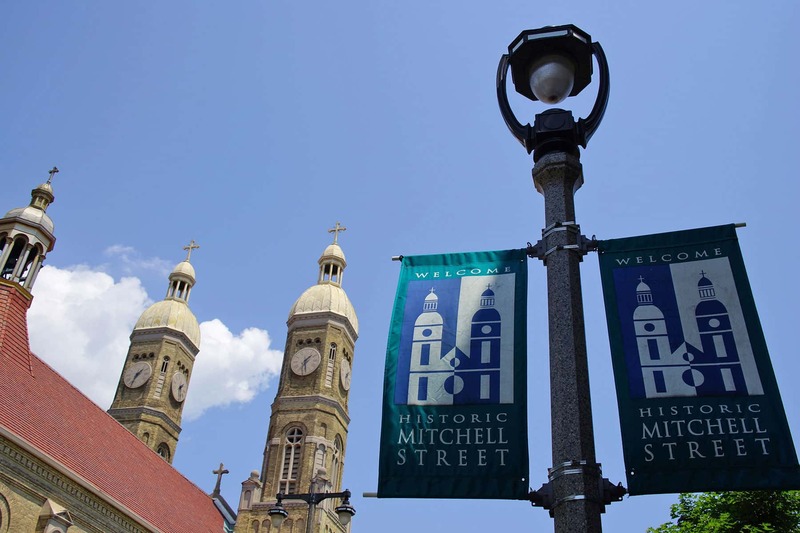 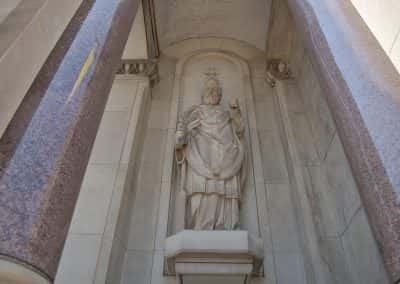 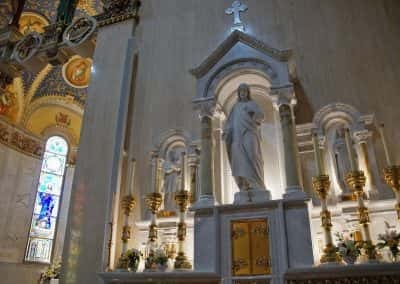 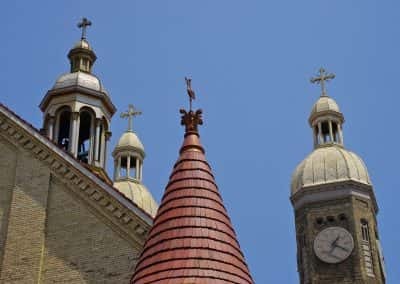 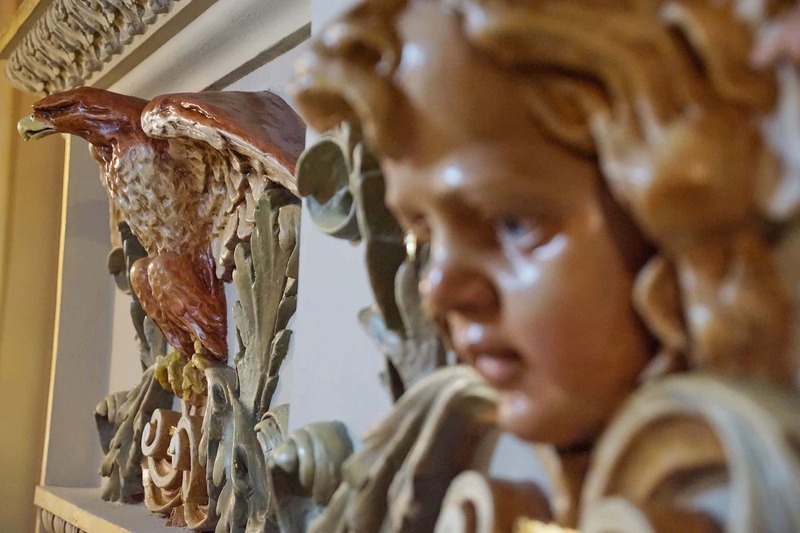 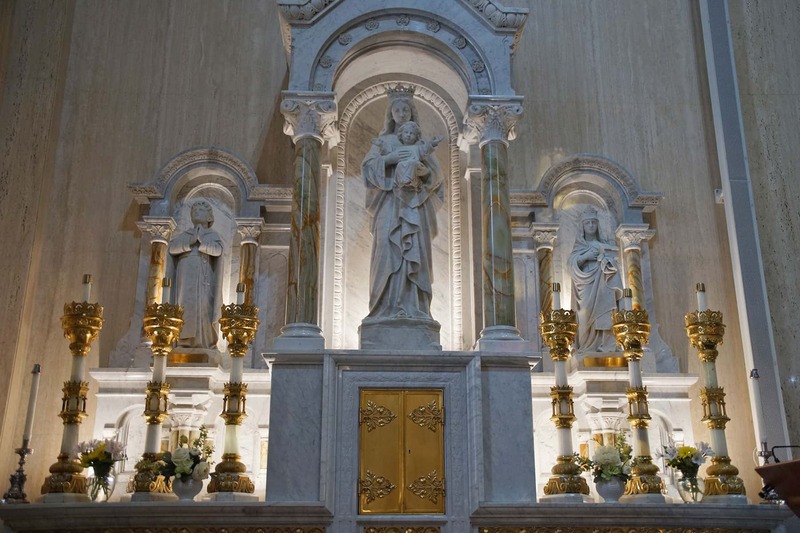 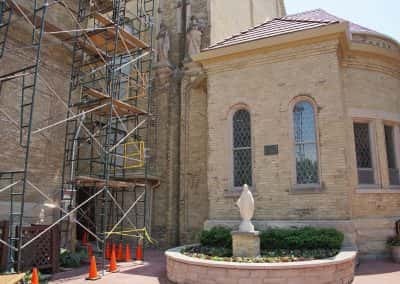 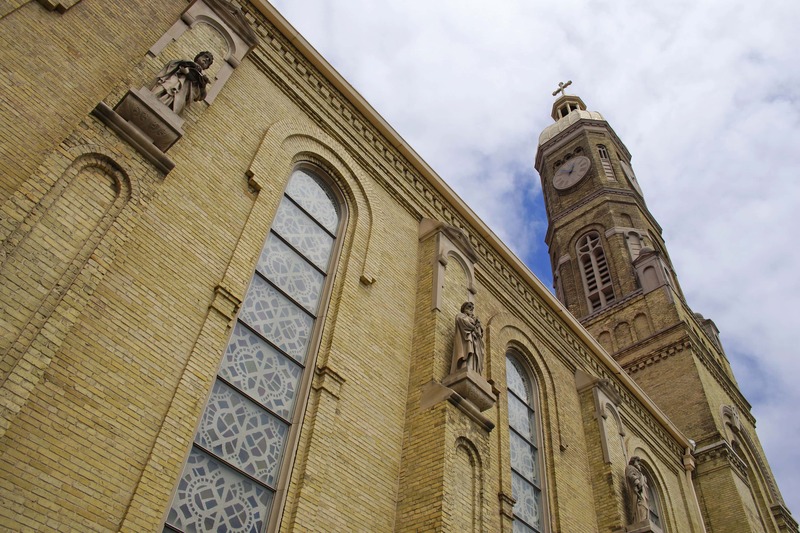 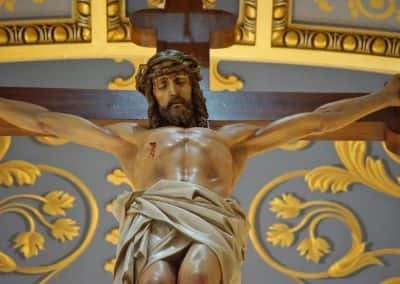 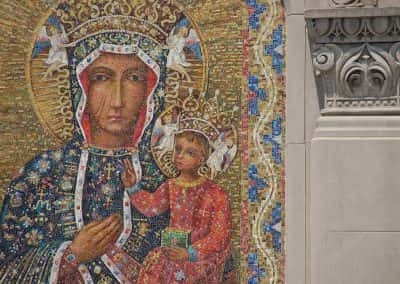 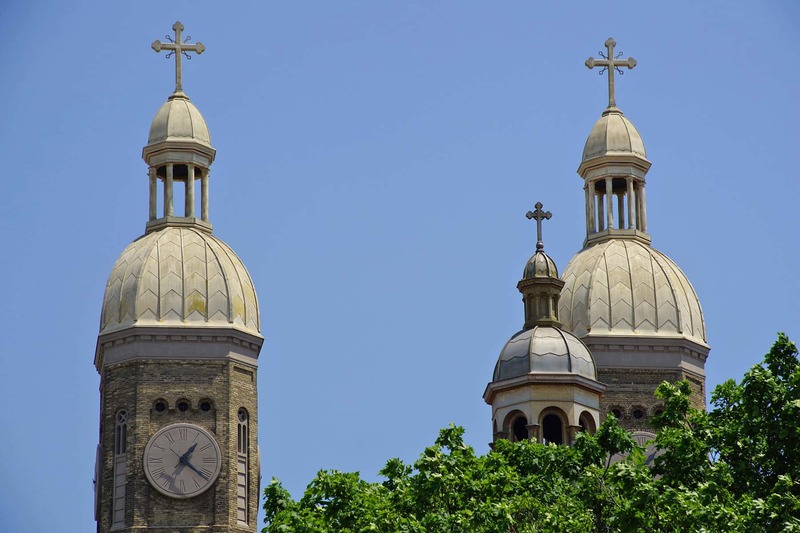 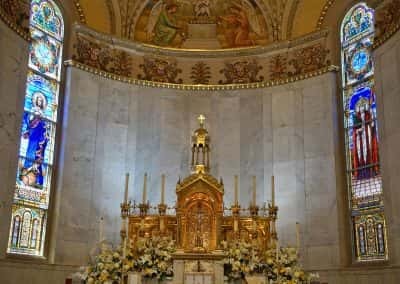 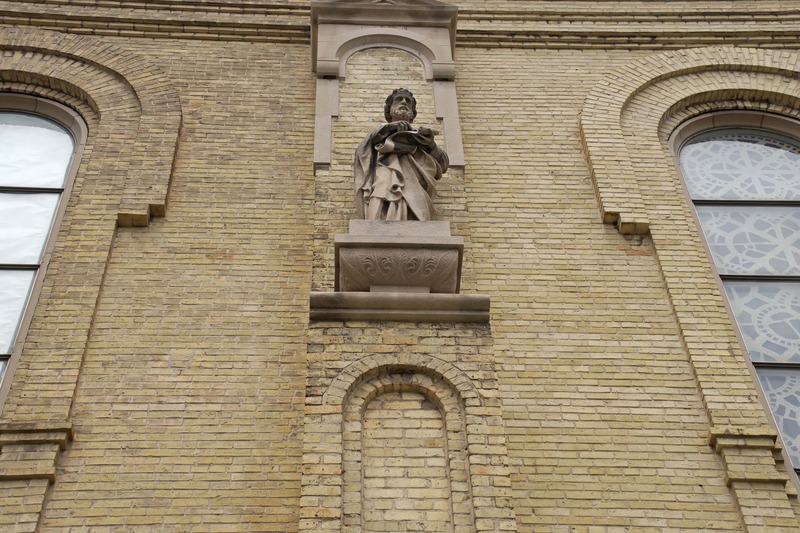 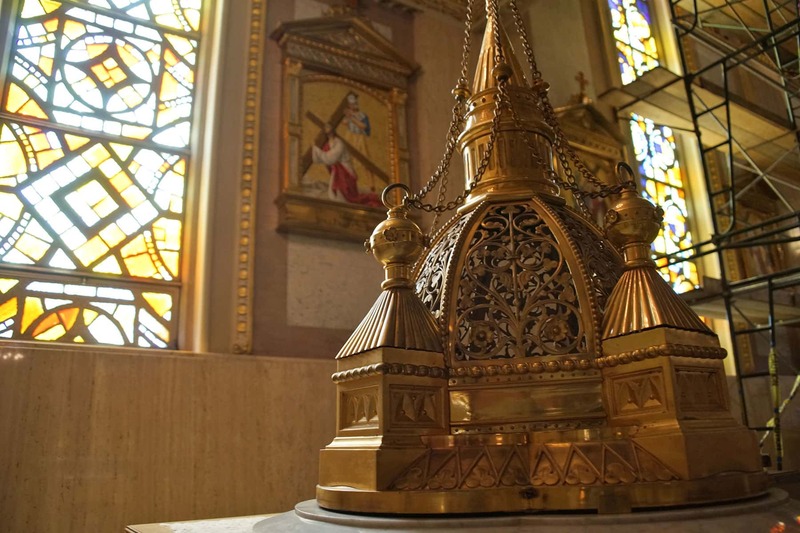 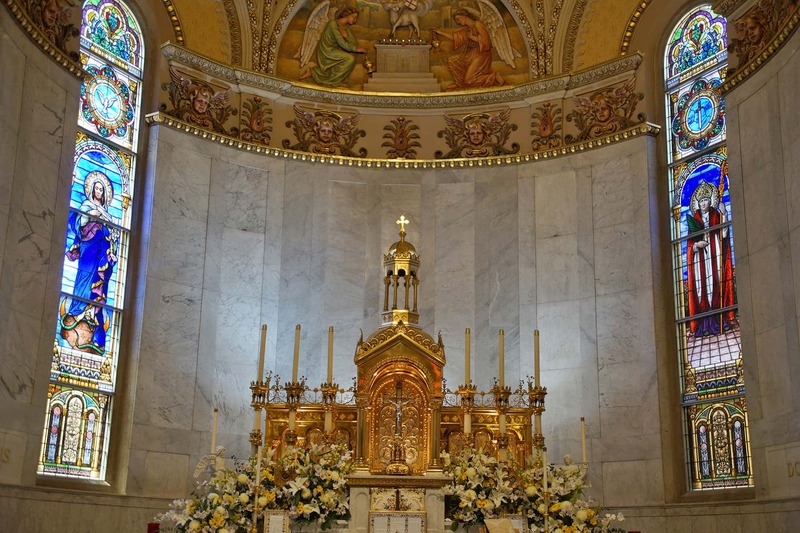 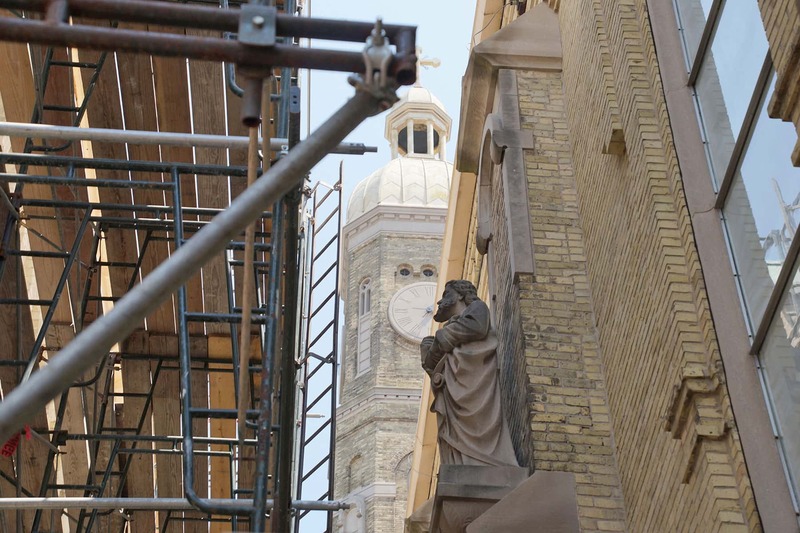 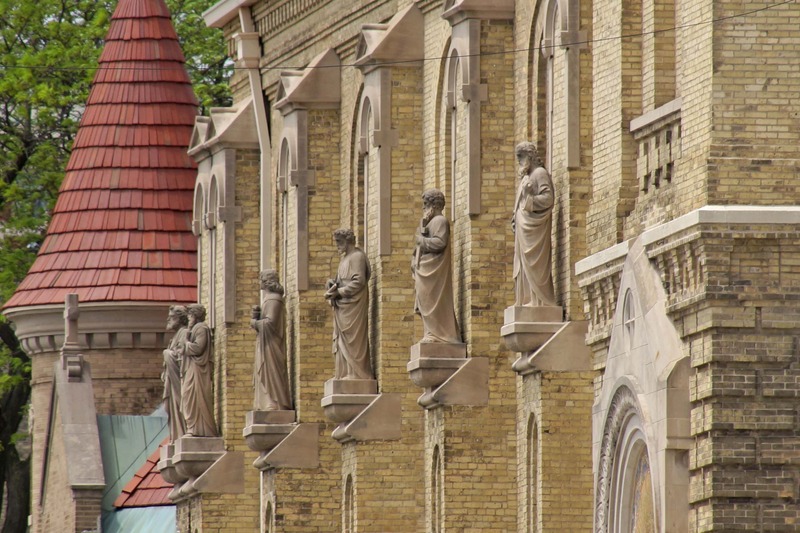 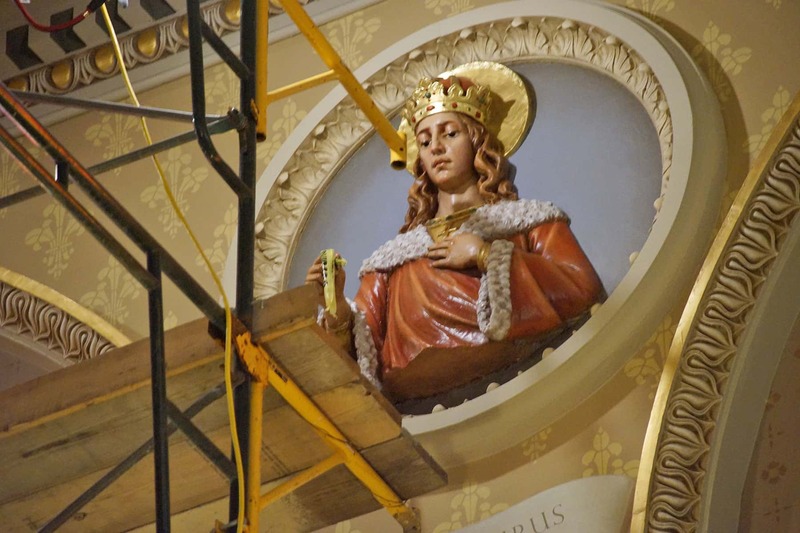 Like other historic churches in the 1960s, Saint Stanislaus had many of its beautiful features obliterated during a major remodeling project, which after decades have nearly been restored by teams of craftsmen and artisans. 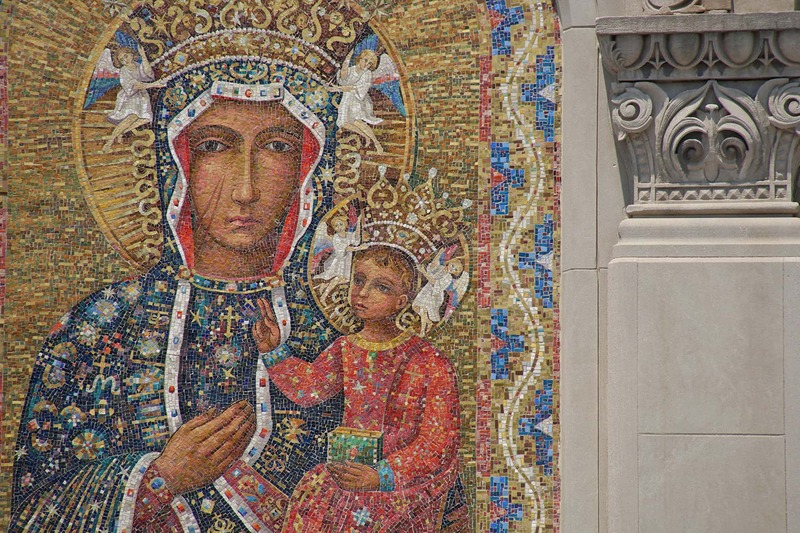 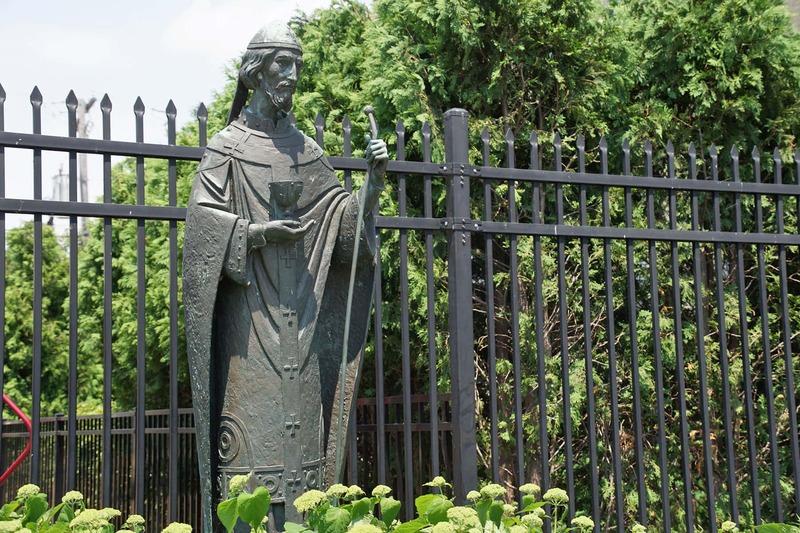 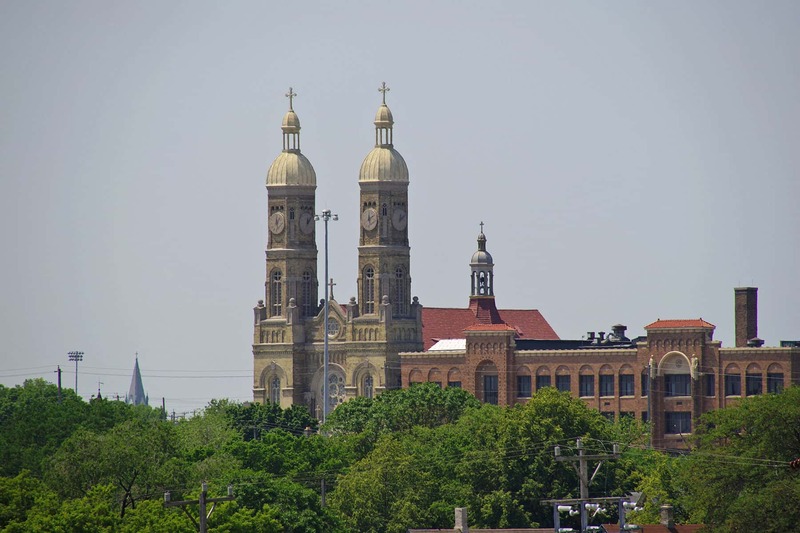 The Polish architect Leonard Schmidtner designed St. Stanislaus Catholic Church. 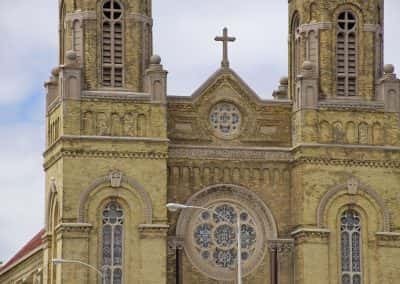 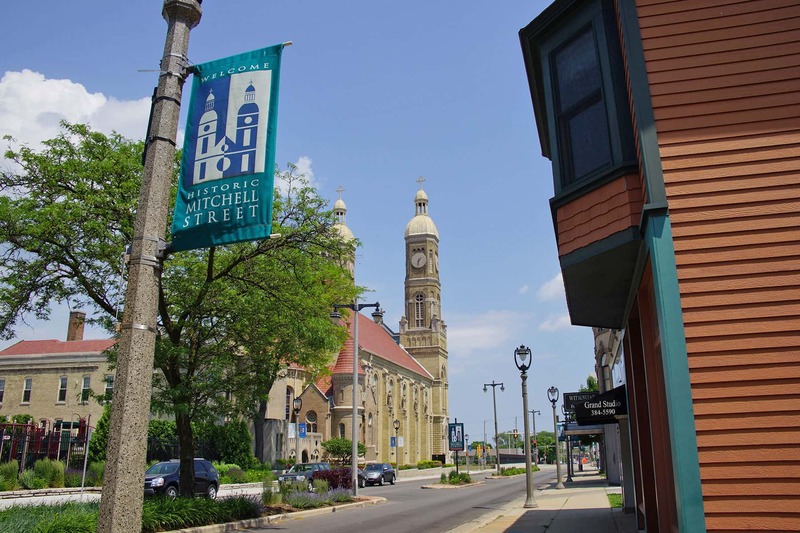 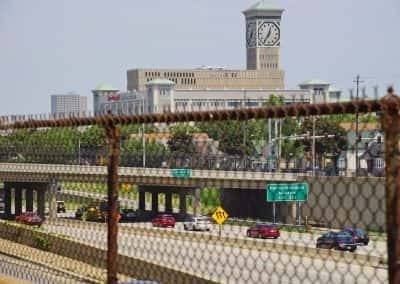 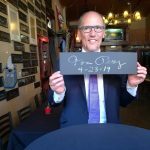 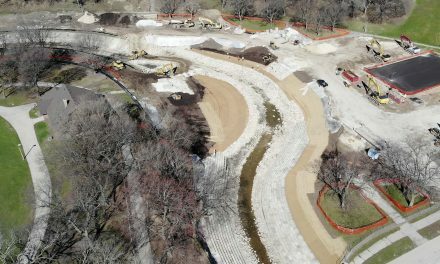 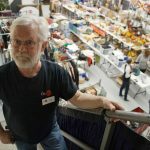 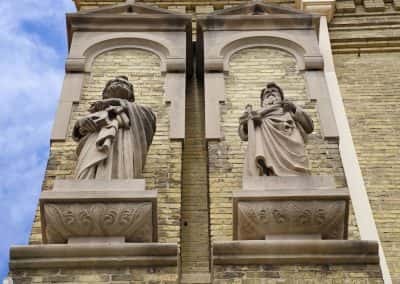 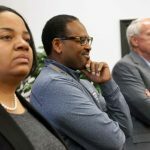 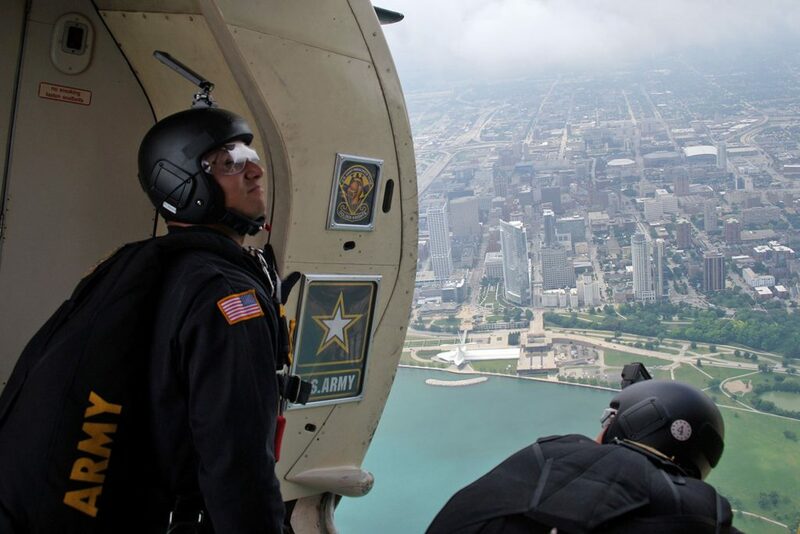 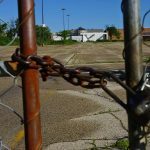 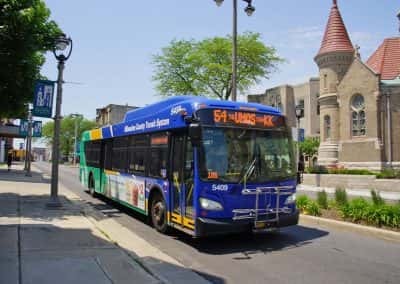 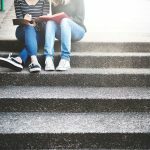 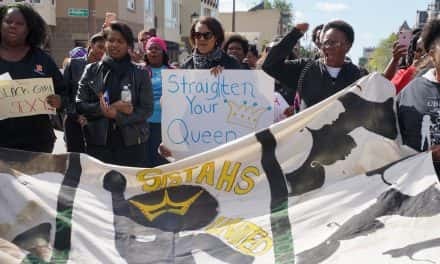 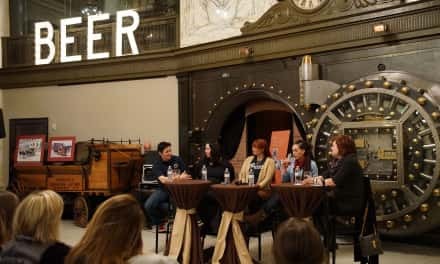 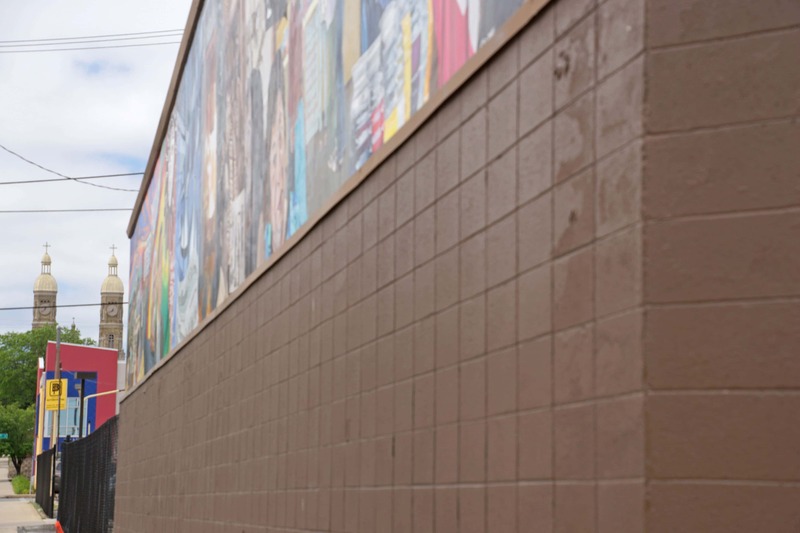 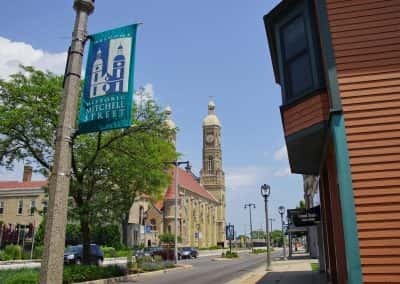 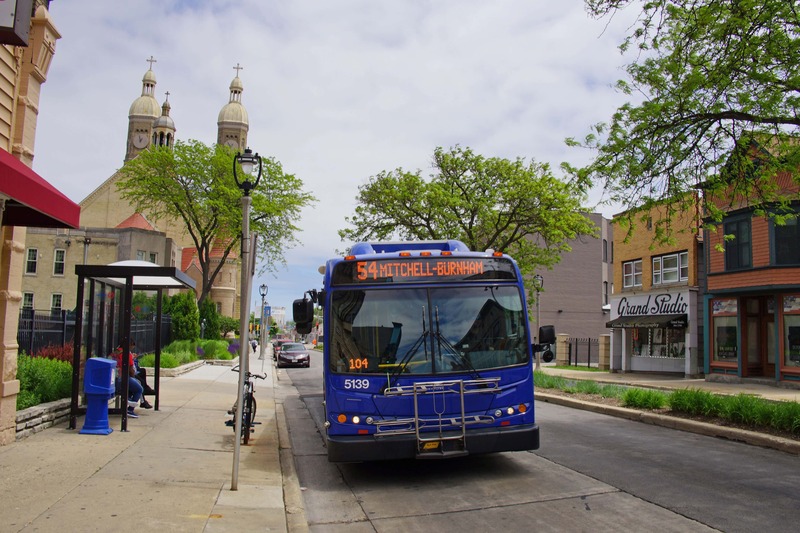 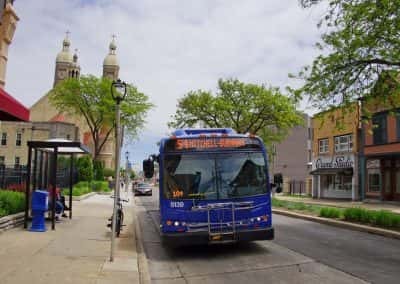 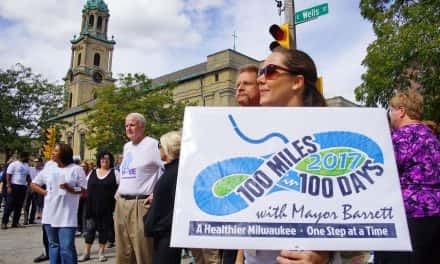 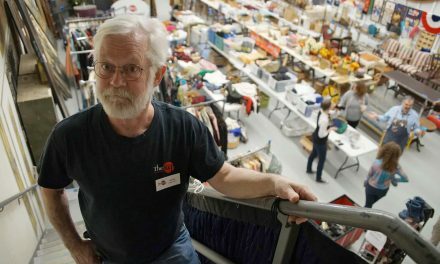 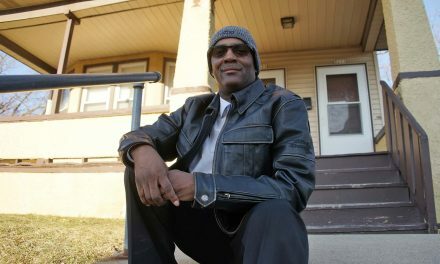 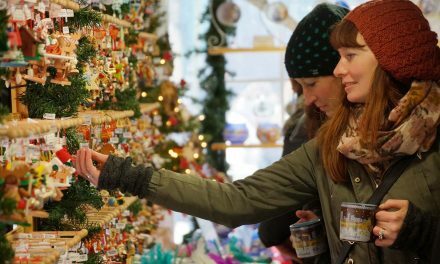 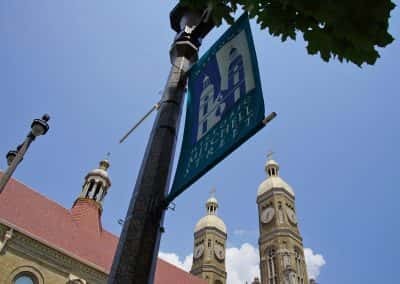 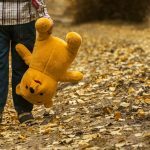 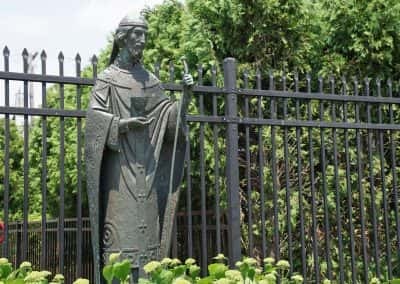 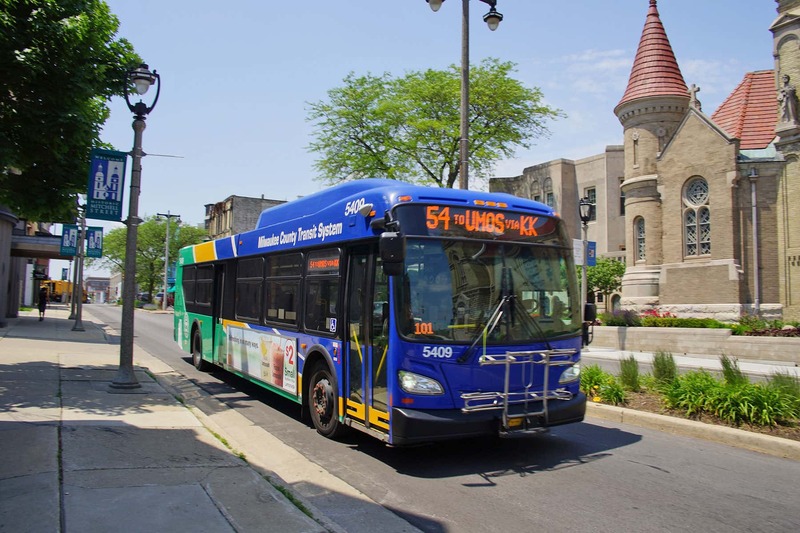 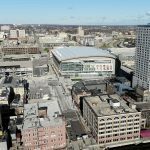 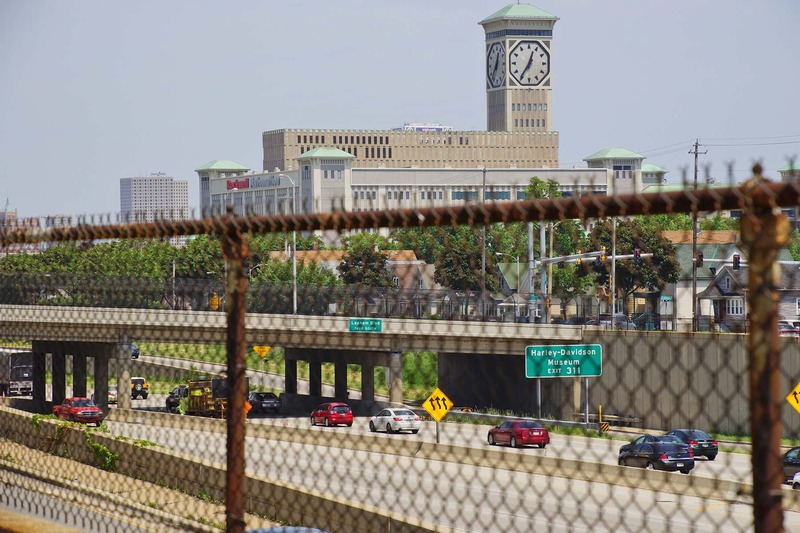 His original name had been Kowalski, but the change was made to improve his work opportunities in Milwaukee’s heavily German immigrant community. 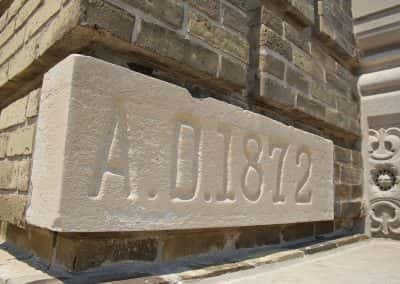 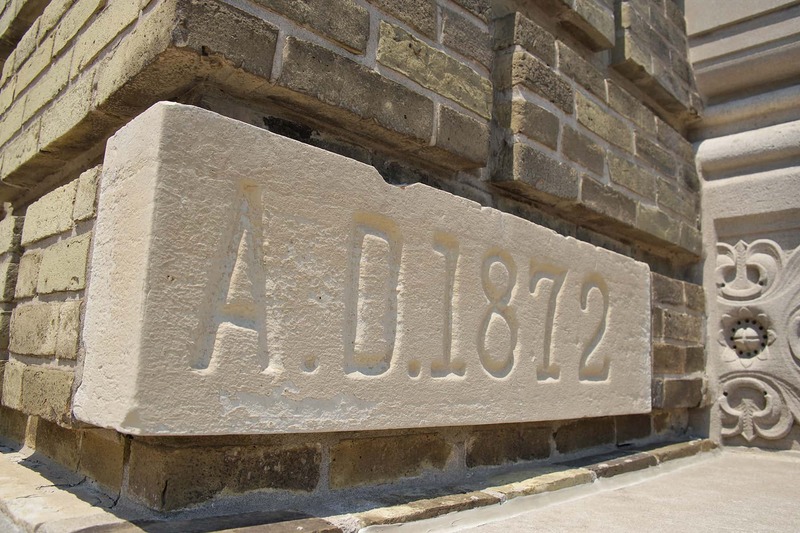 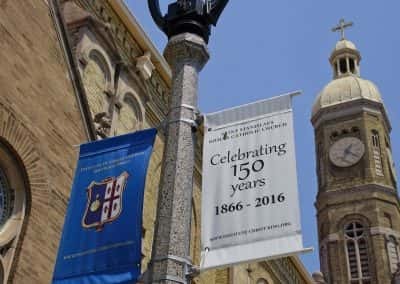 The Church’s cornerstone was placed in 1872, and the twin spires of cream-city brick were completed the following year. 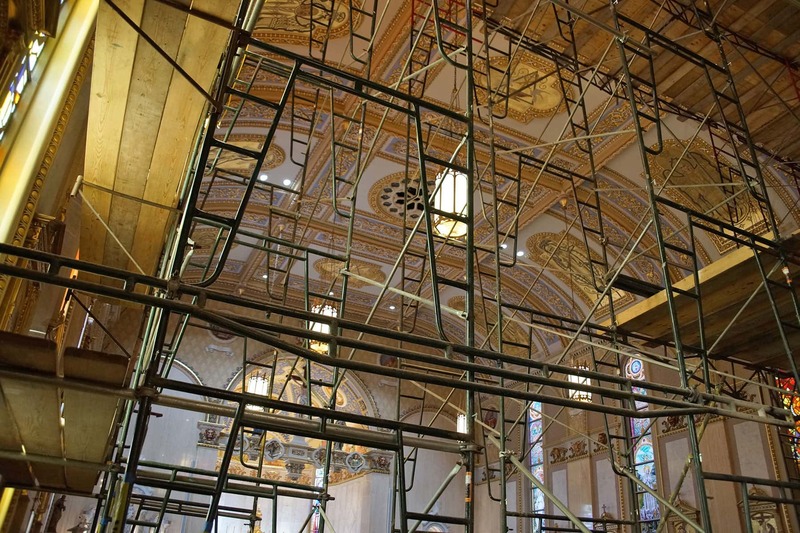 During the 1966 remodel, the marble and other trim features were painted beige to match the color of the Sanctuary walls. 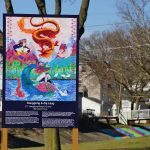 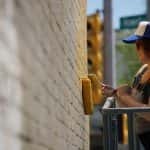 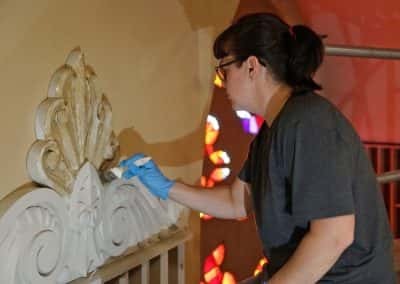 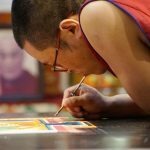 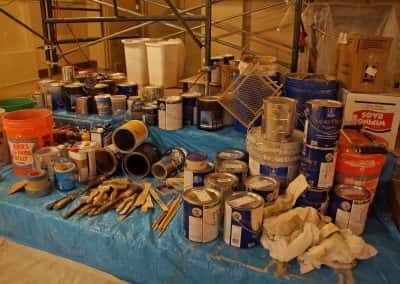 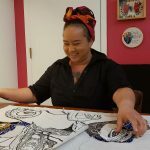 Recently, artists from the Conrad Schmitt Studios began the painstaking process of peeling back those layers of old paint. 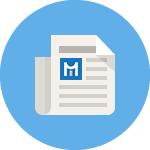 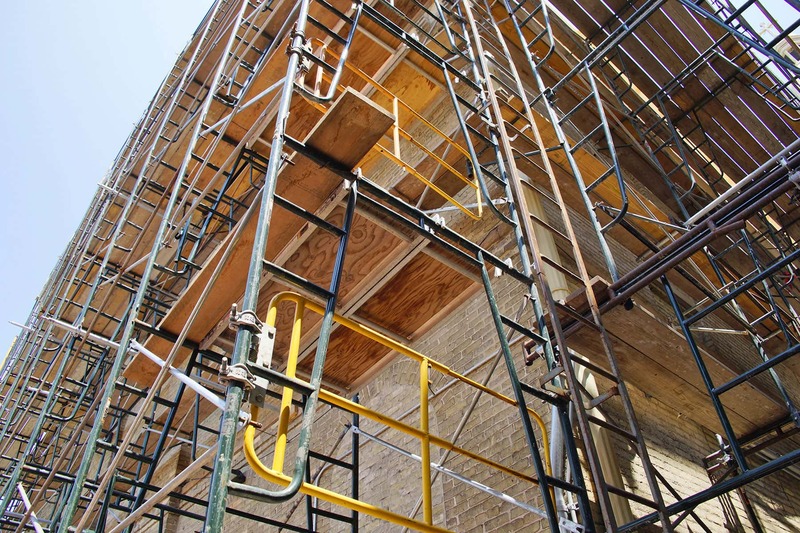 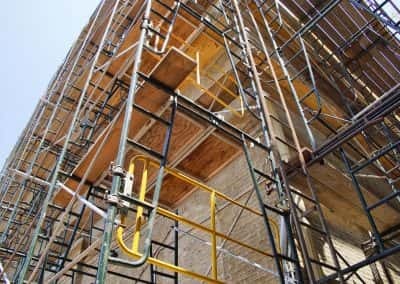 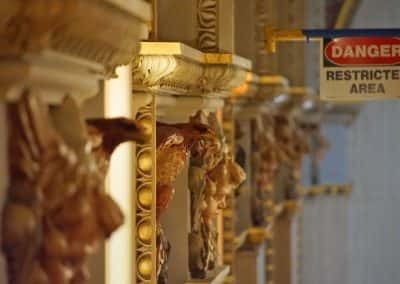 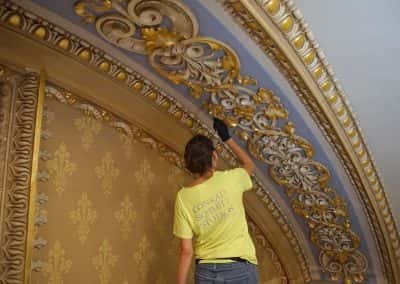 After major structural renovation were completed last year, this last phase is restoring the historic look of the molding and sculptured details. 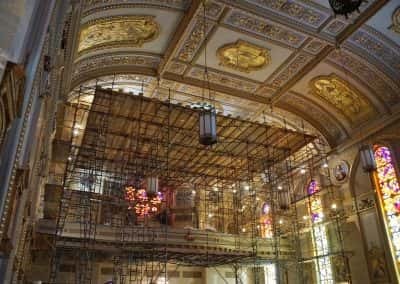 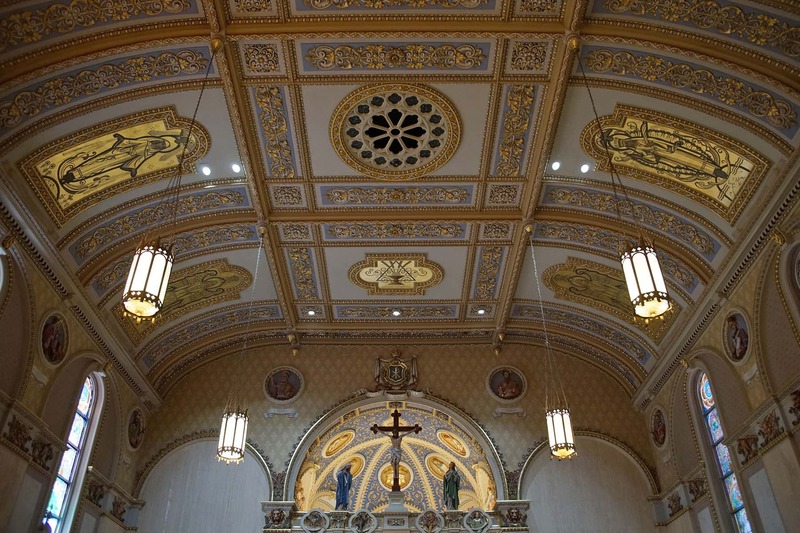 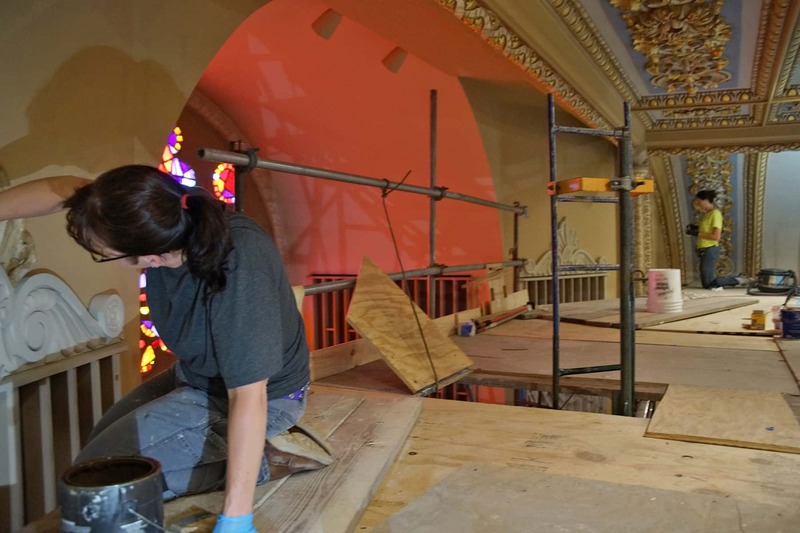 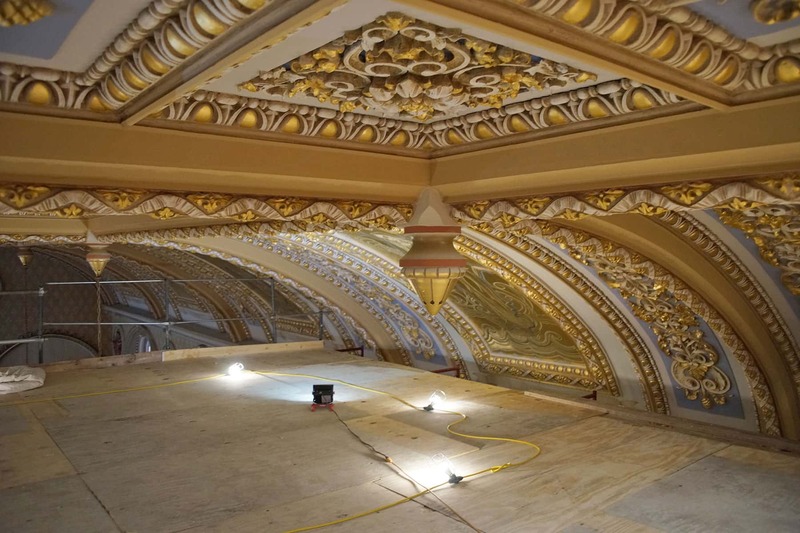 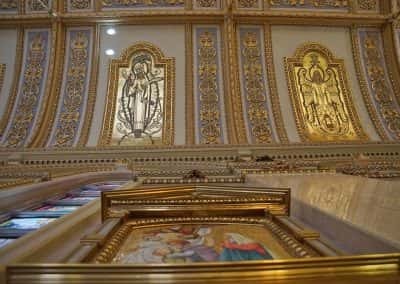 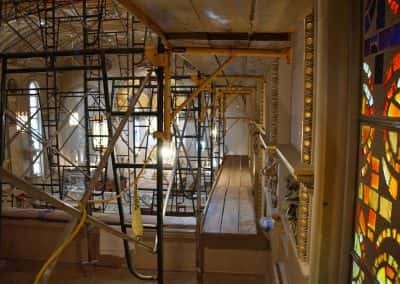 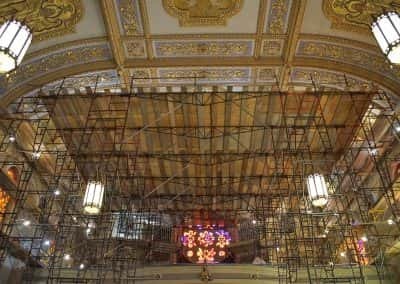 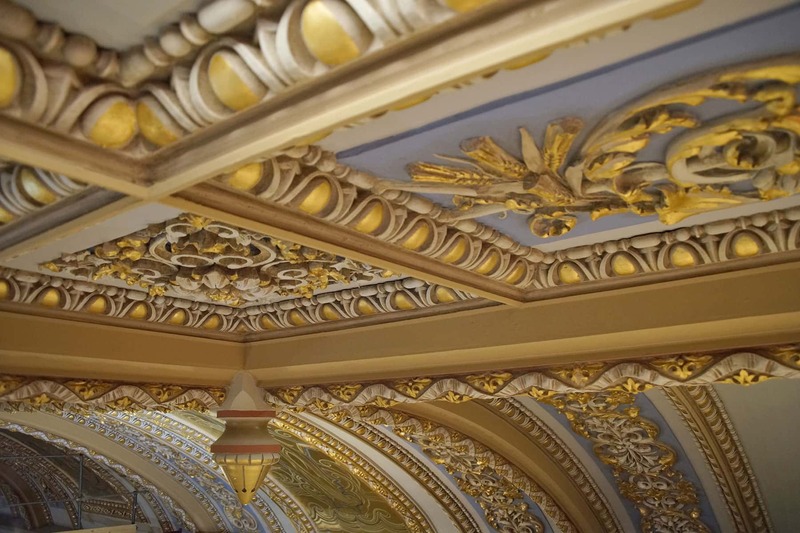 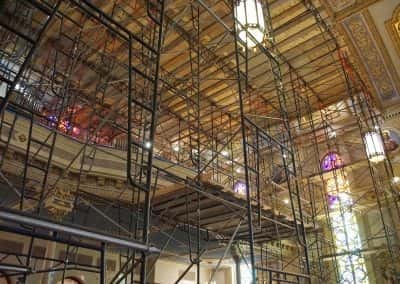 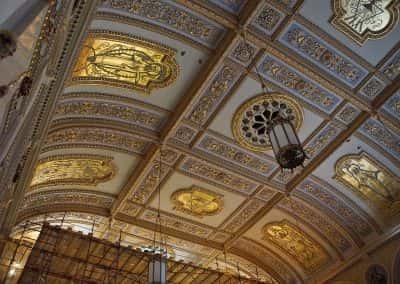 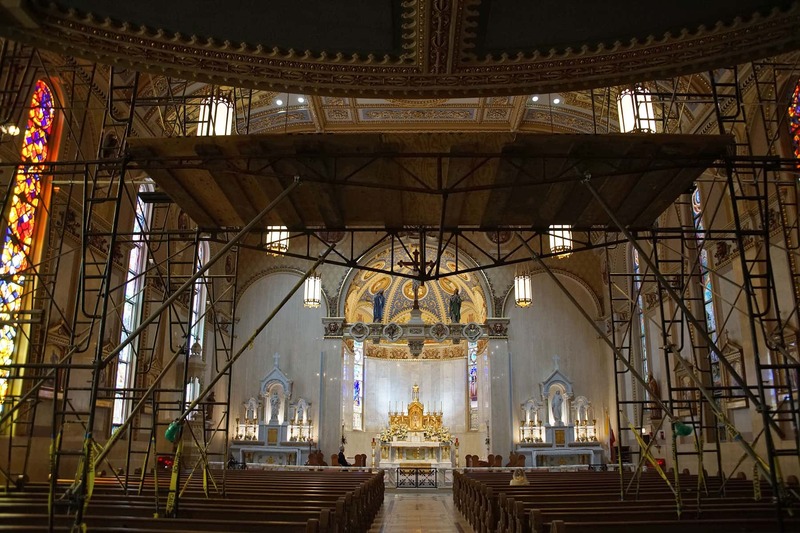 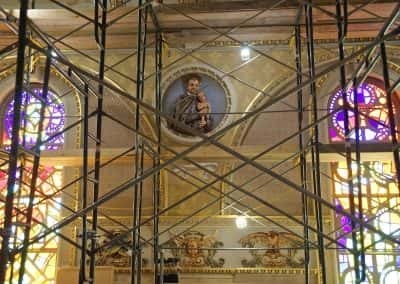 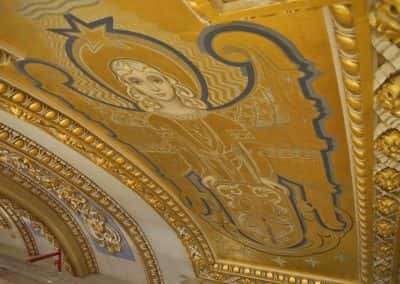 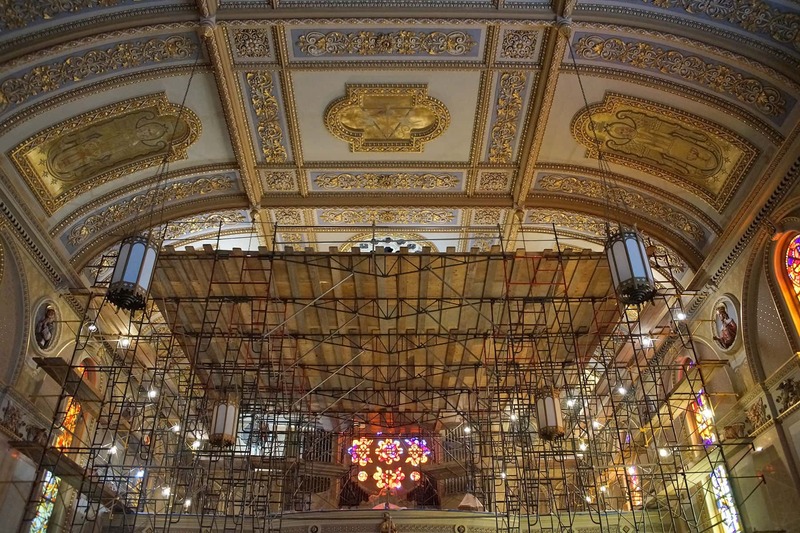 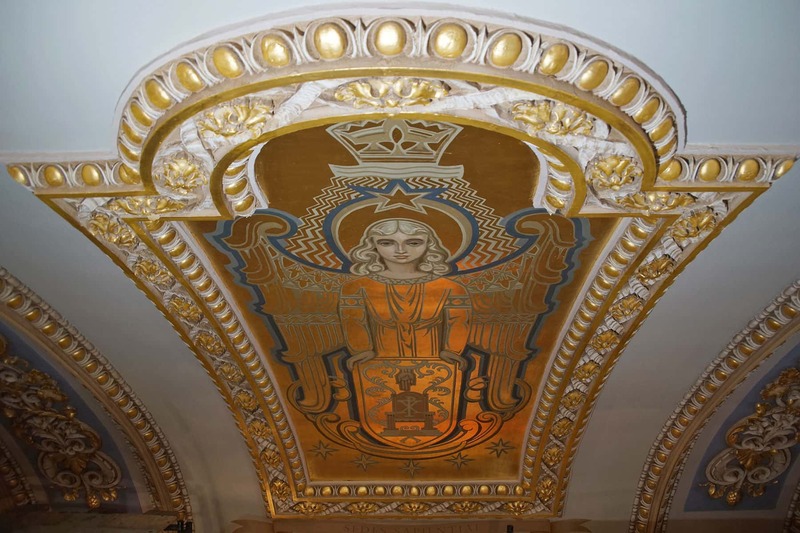 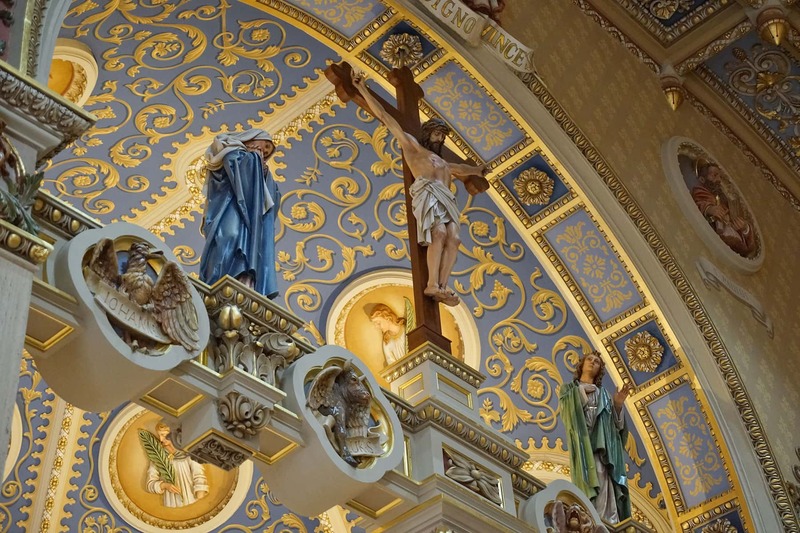 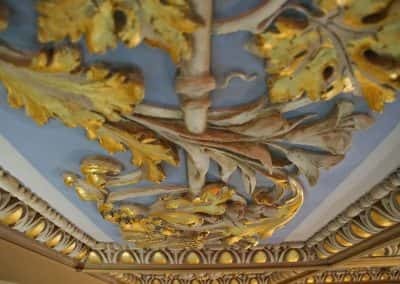 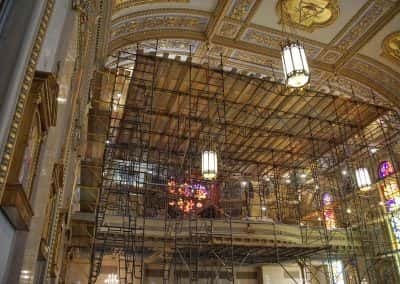 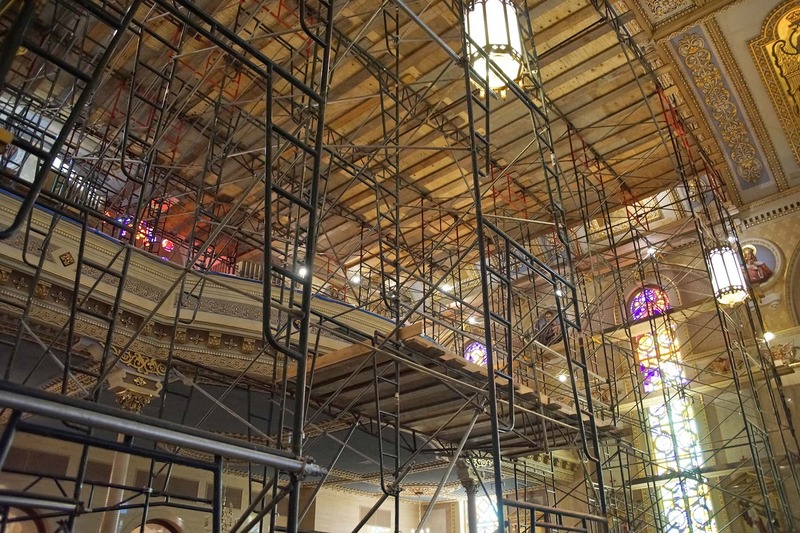 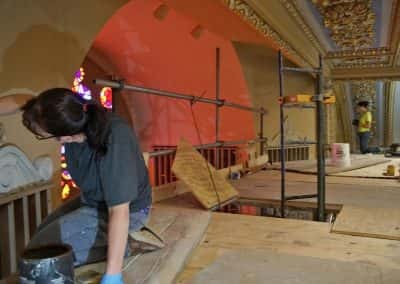 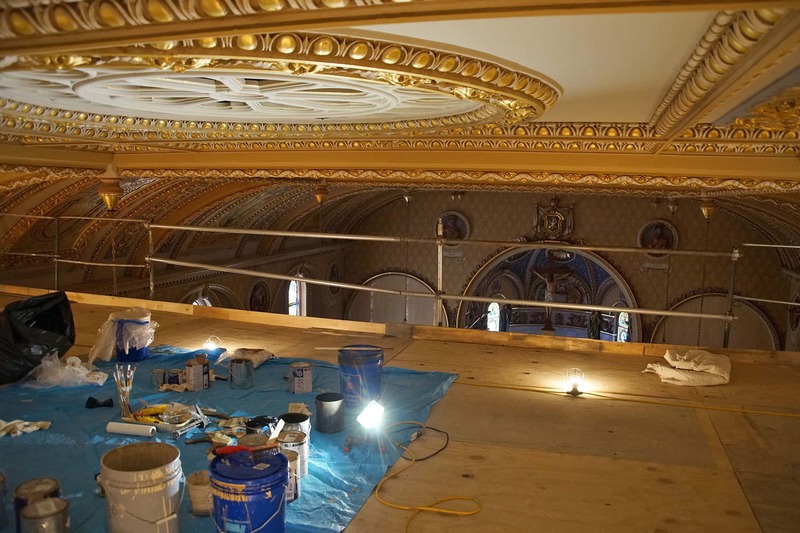 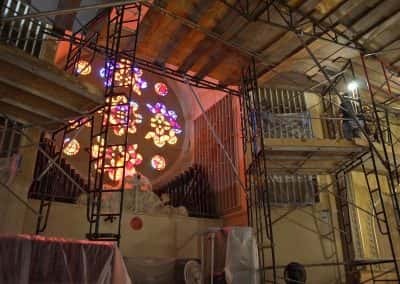 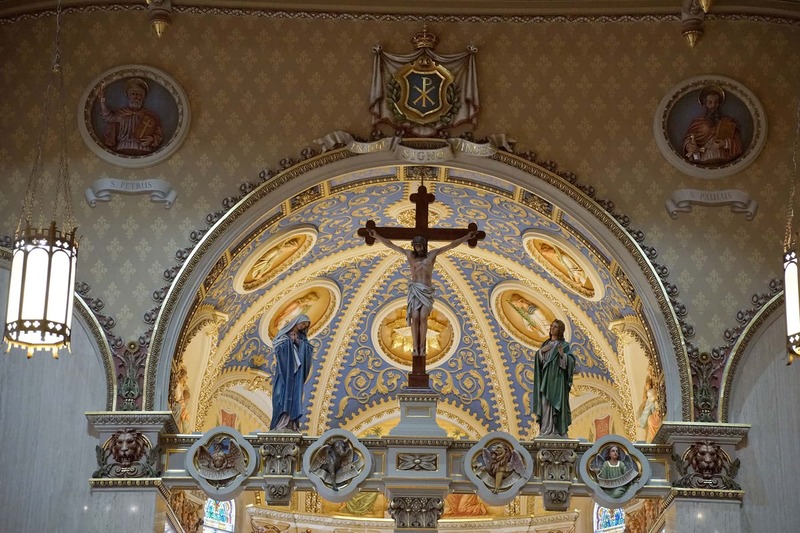 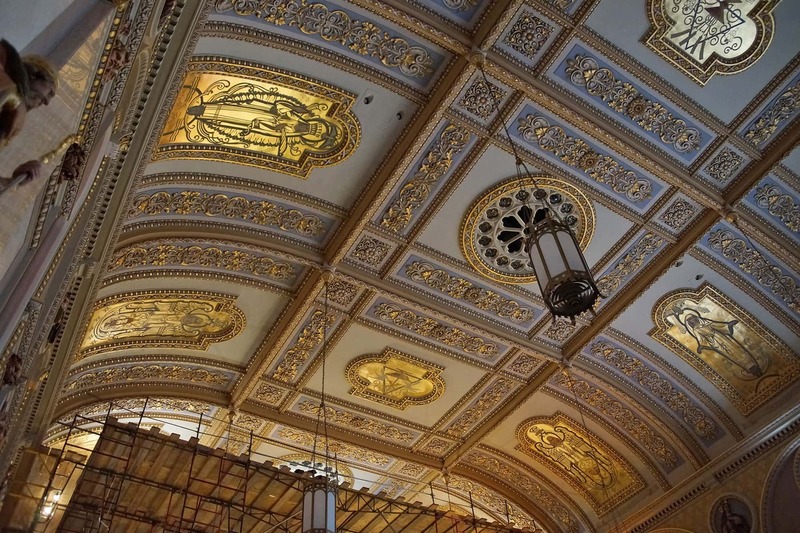 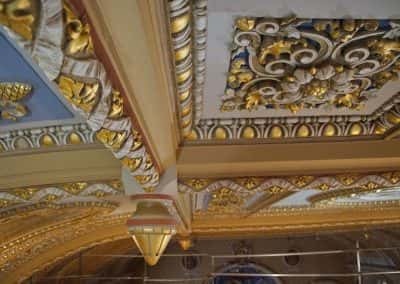 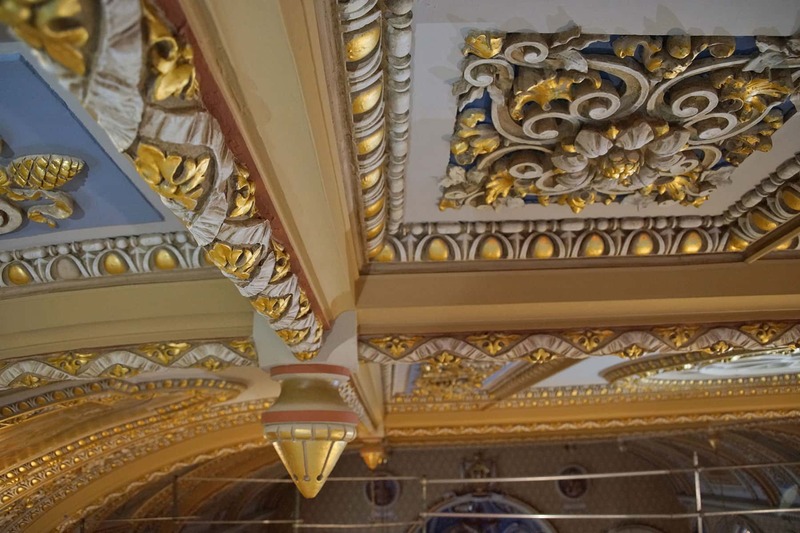 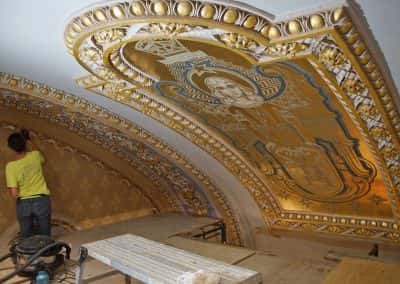 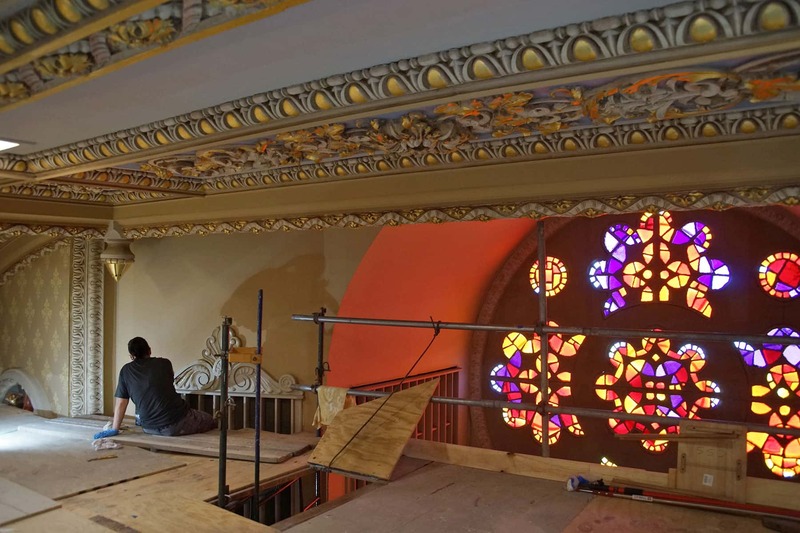 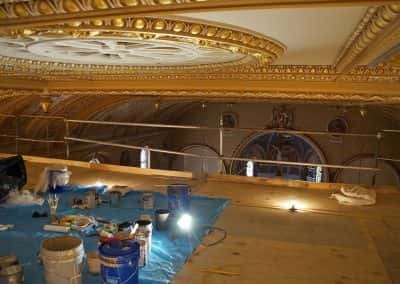 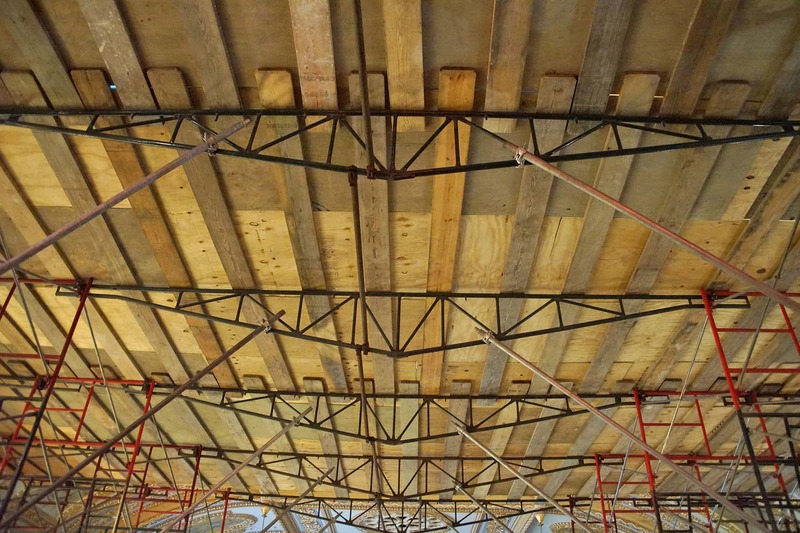 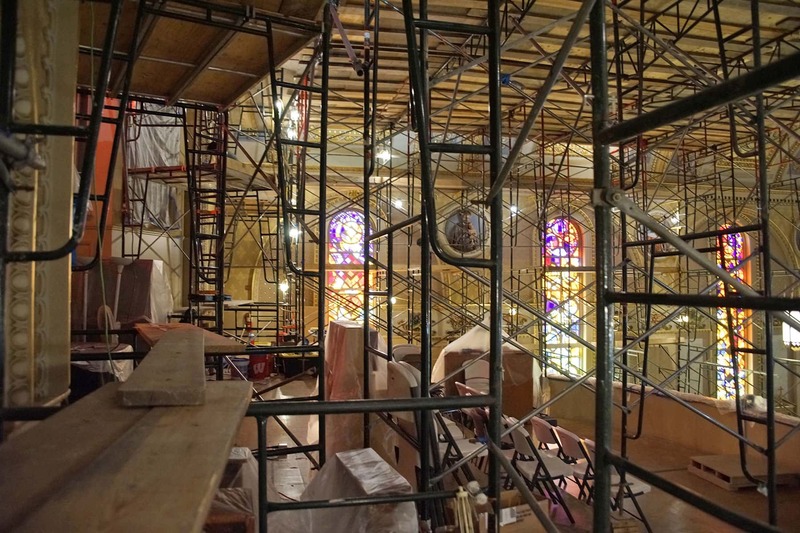 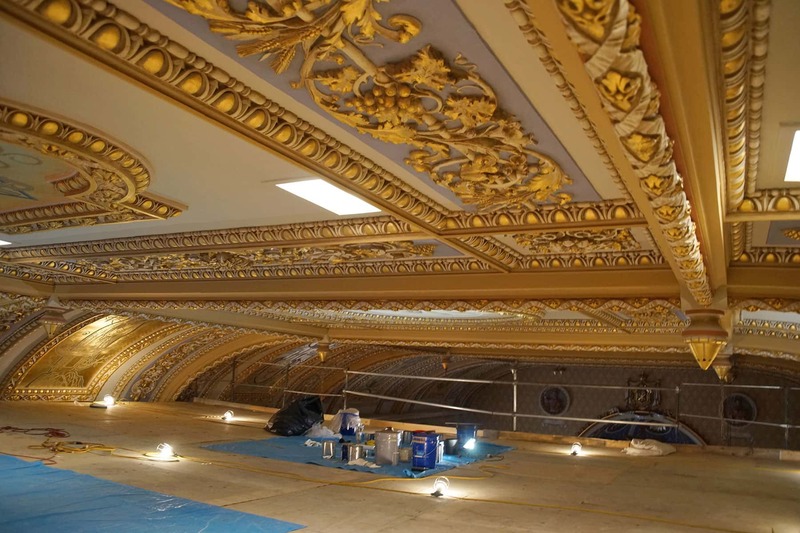 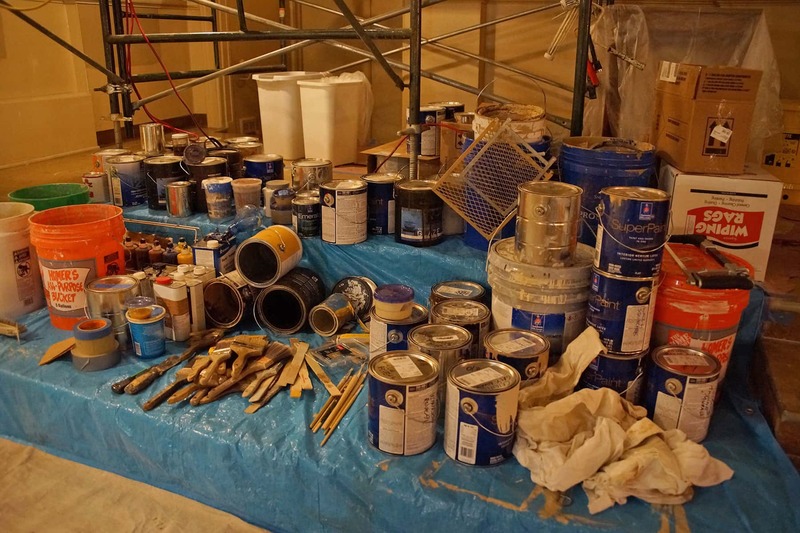 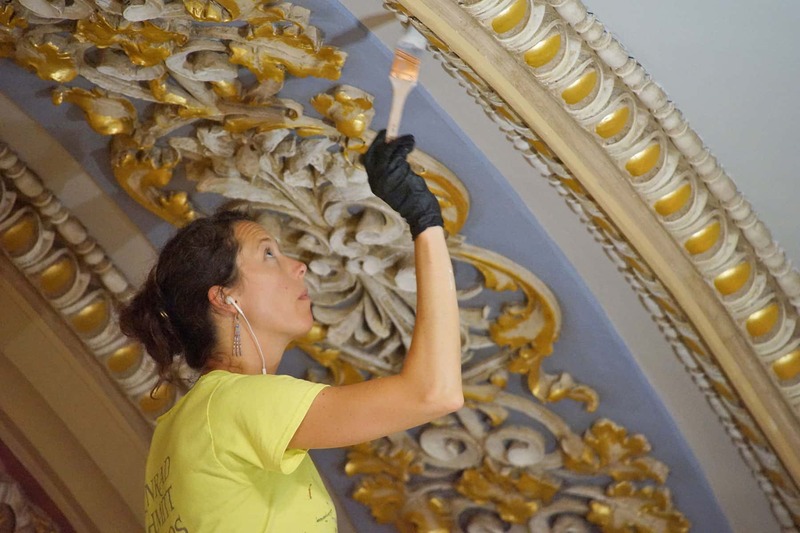 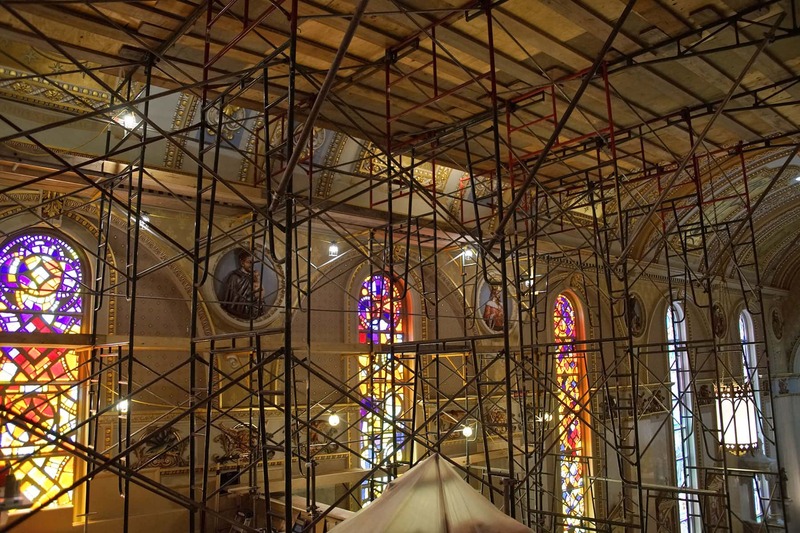 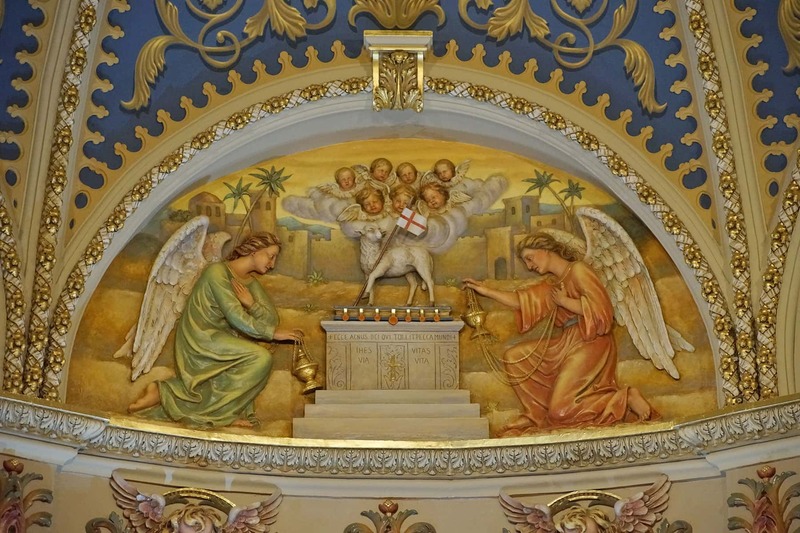 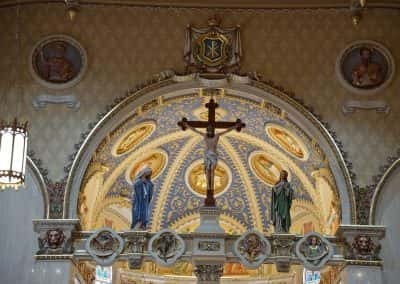 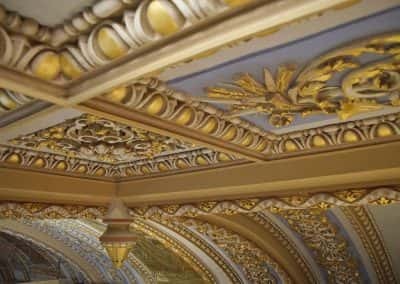 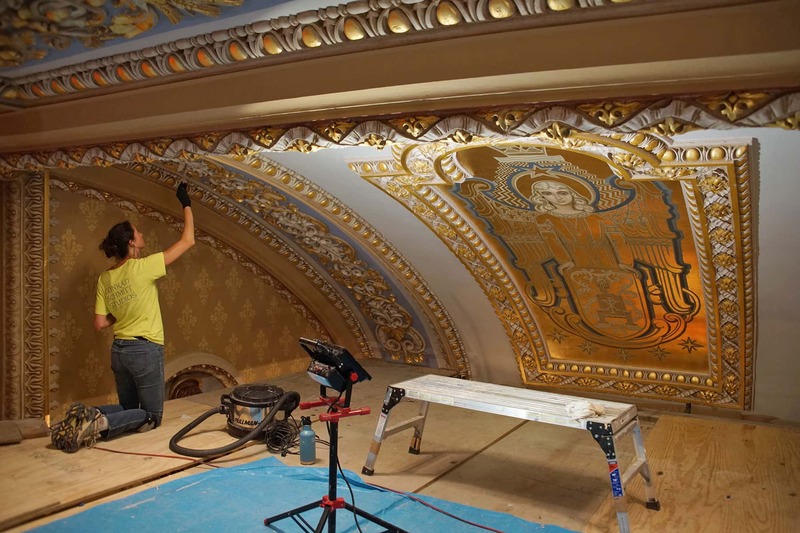 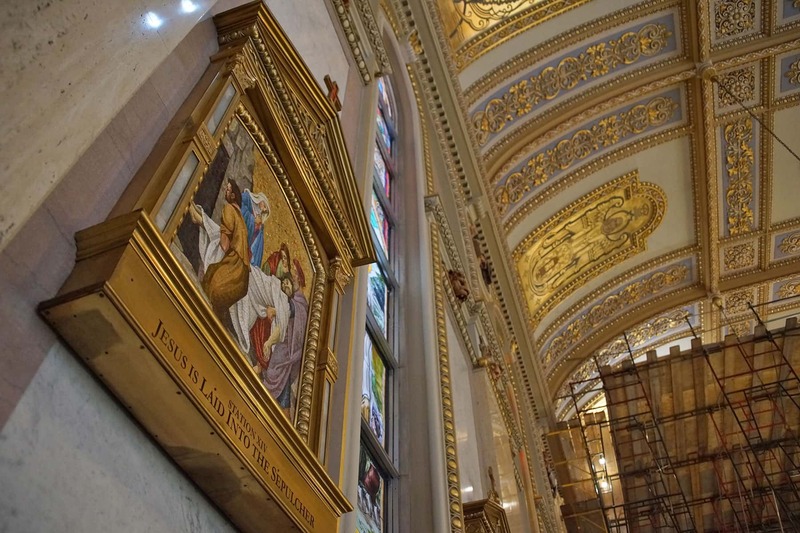 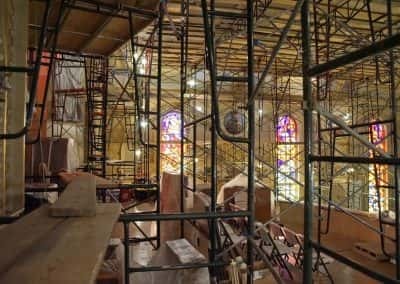 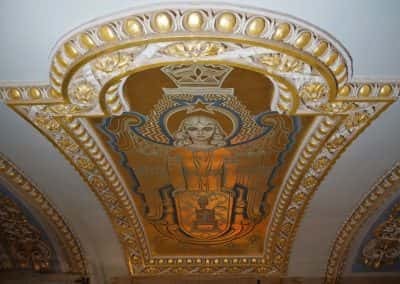 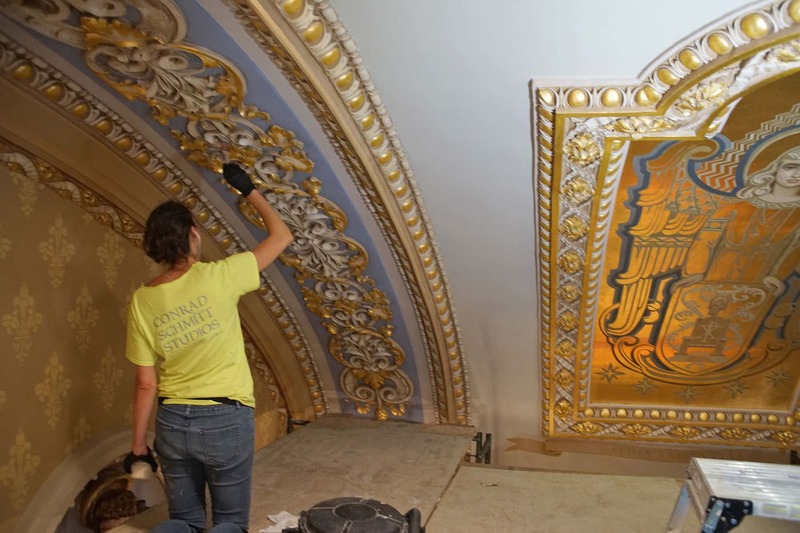 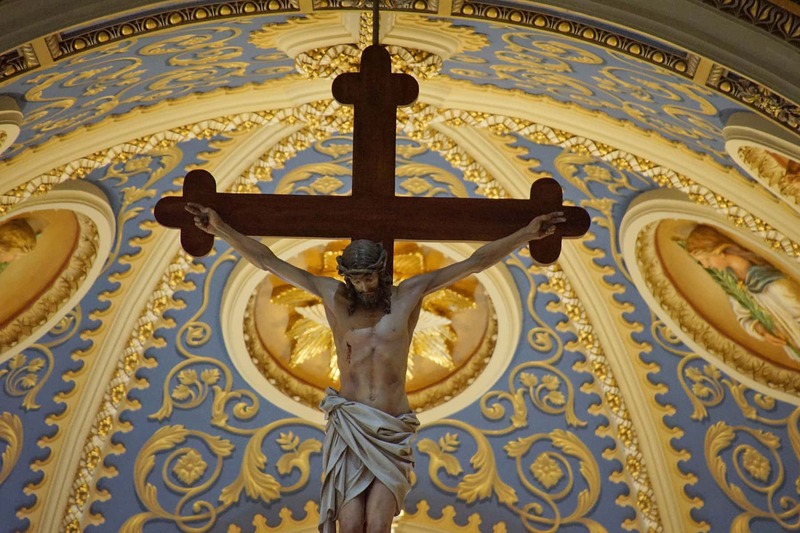 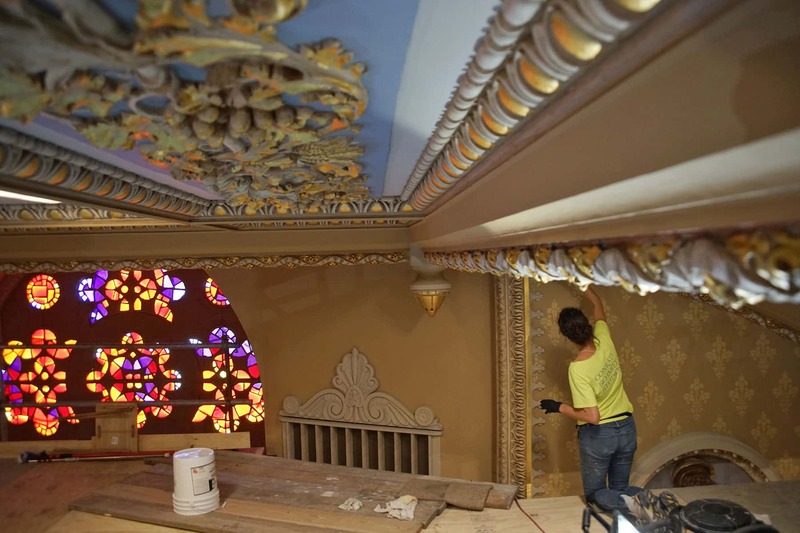 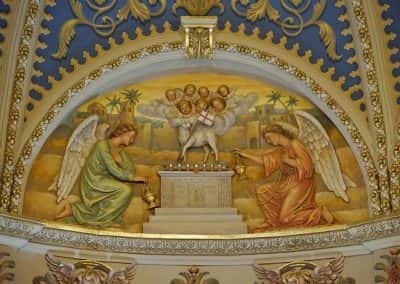 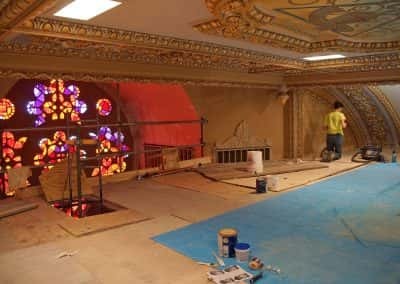 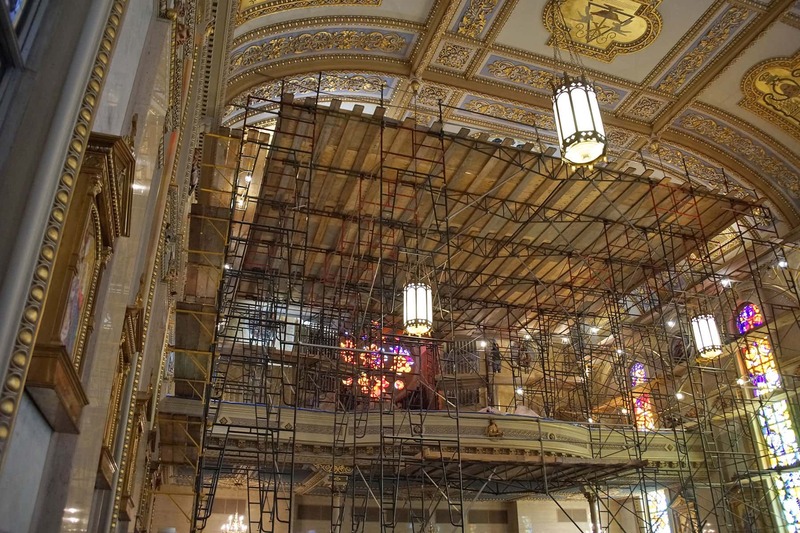 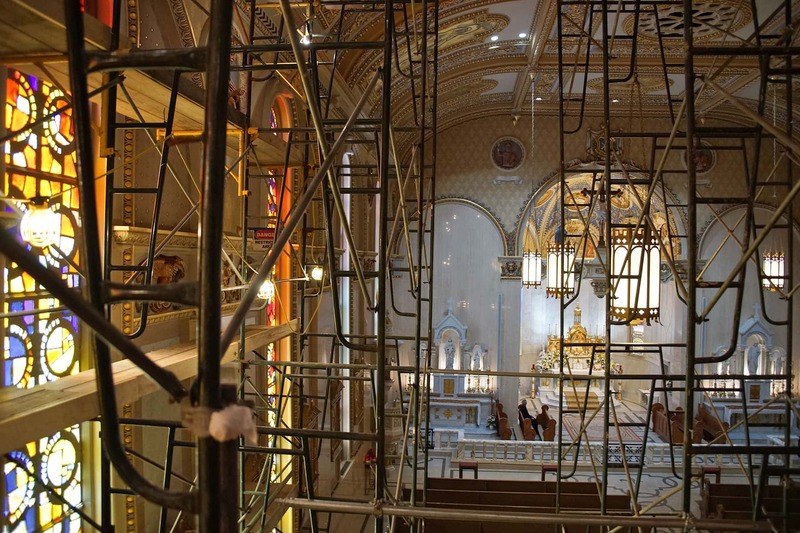 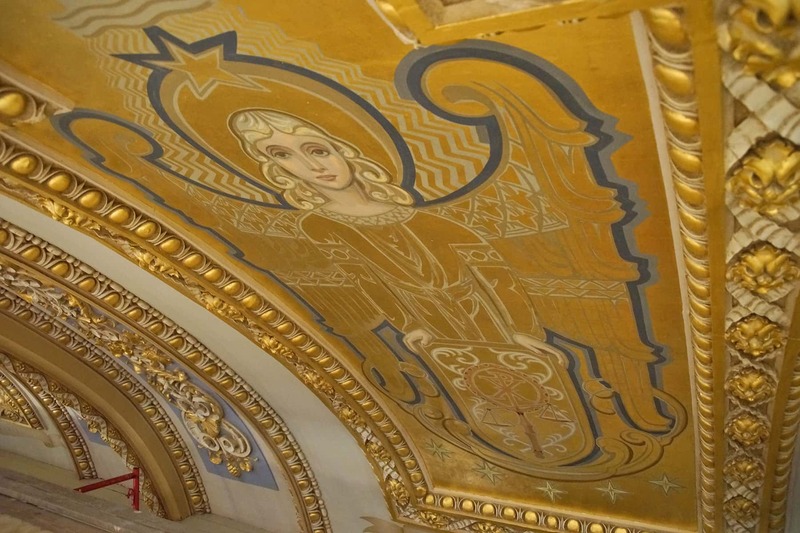 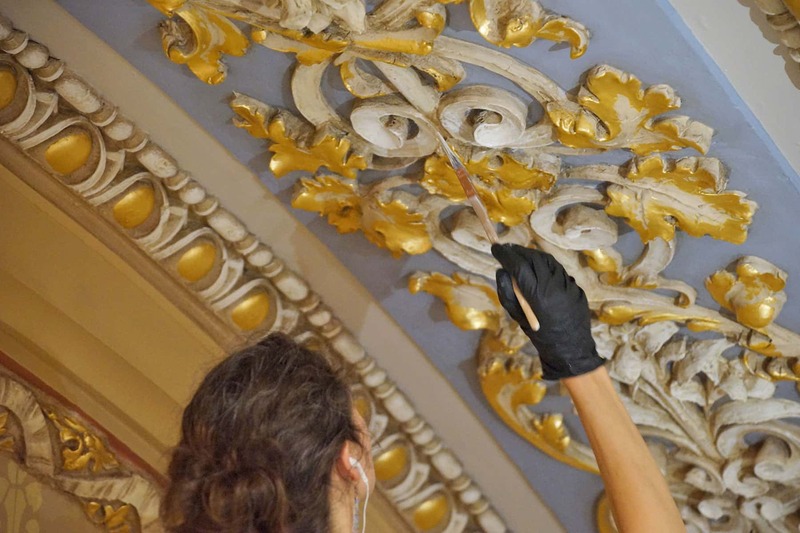 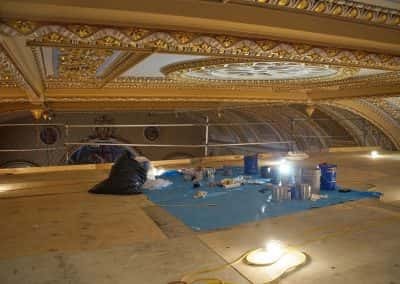 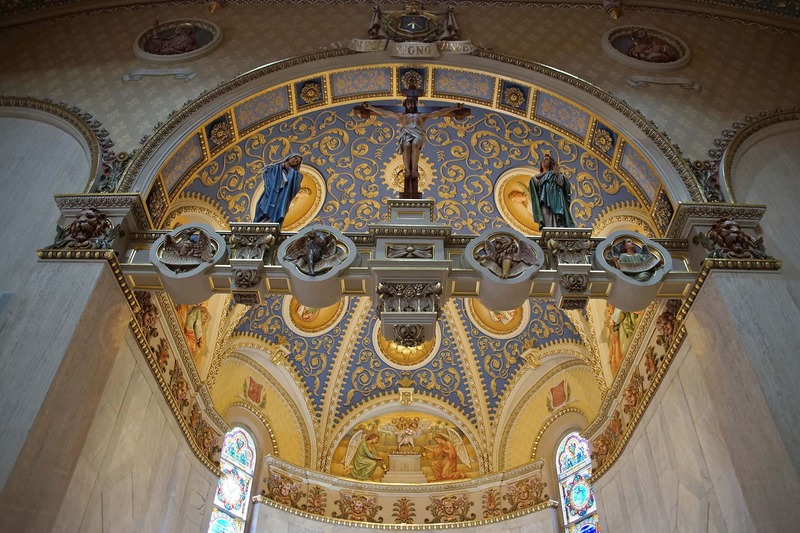 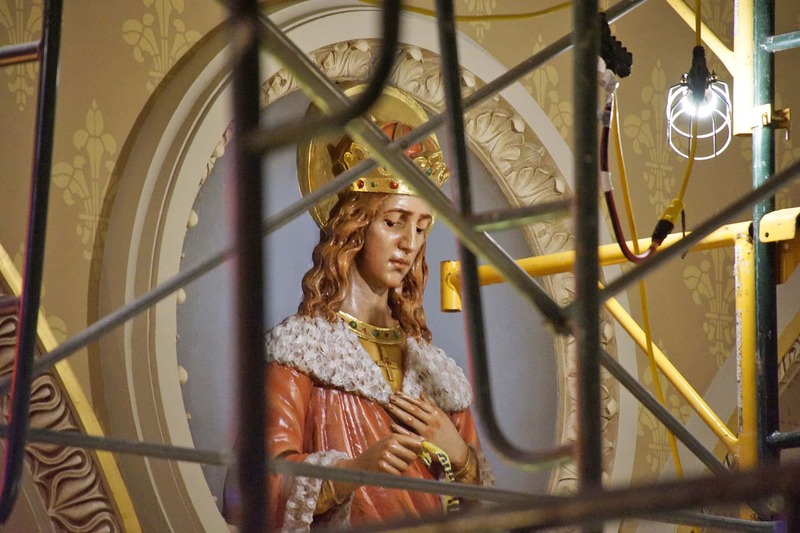 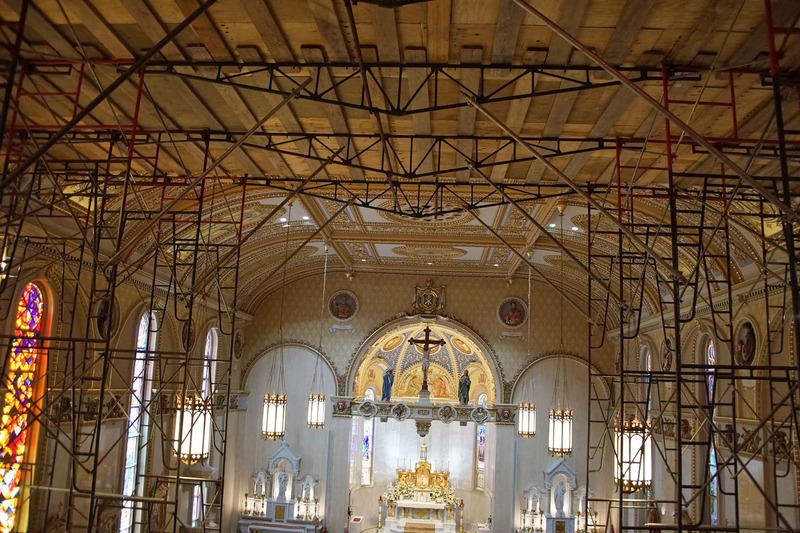 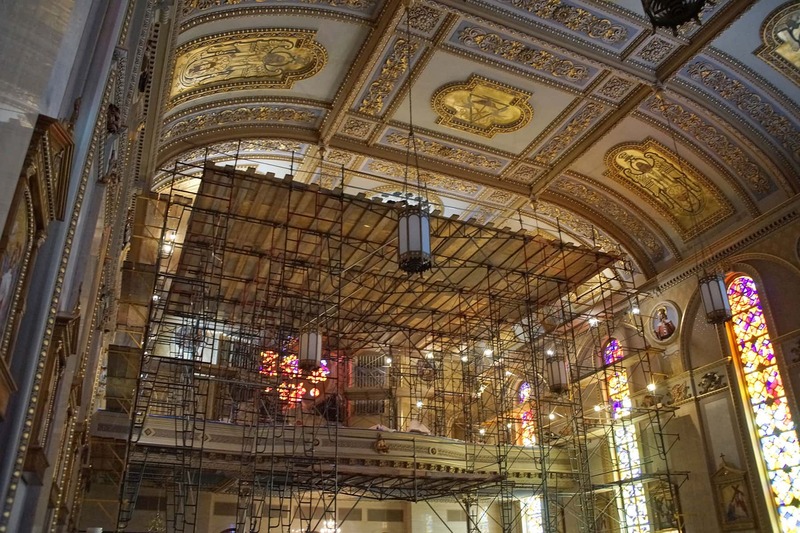 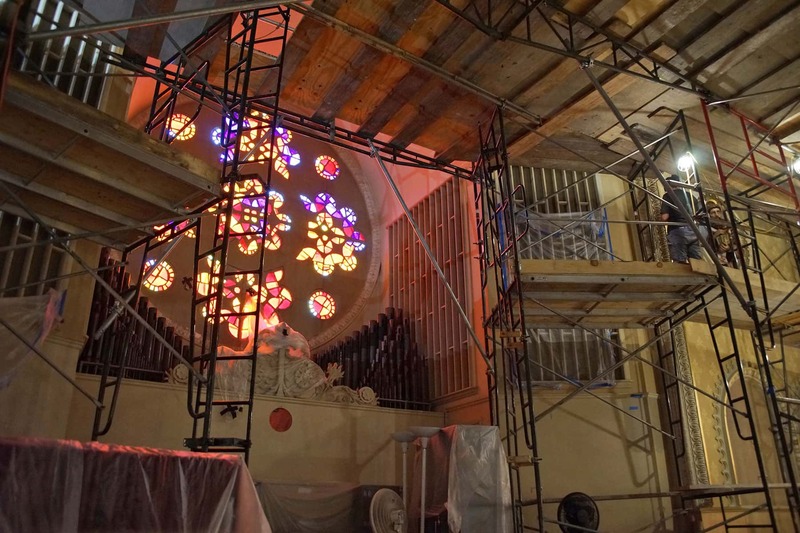 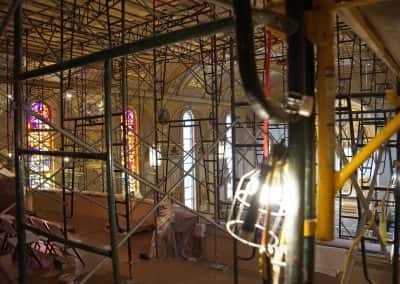 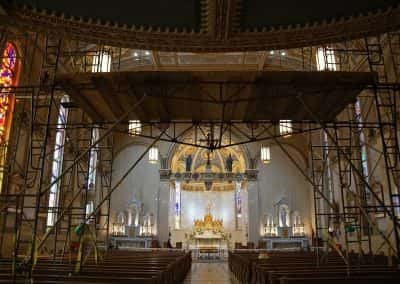 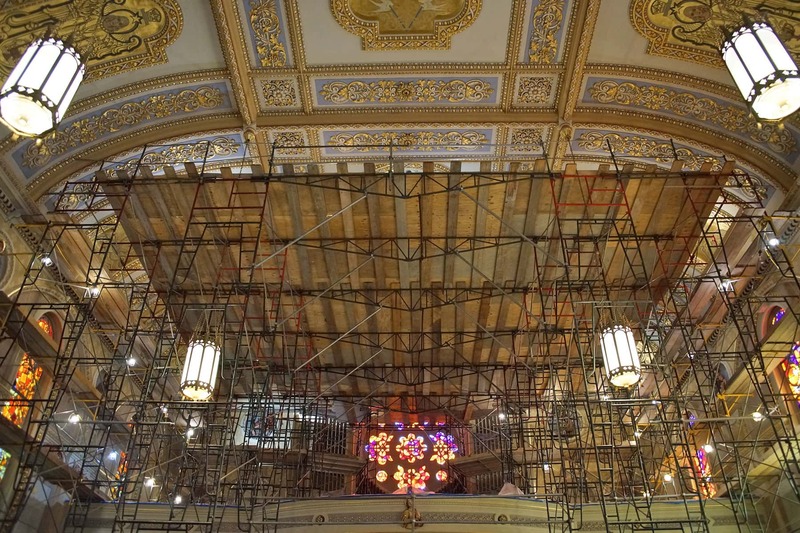 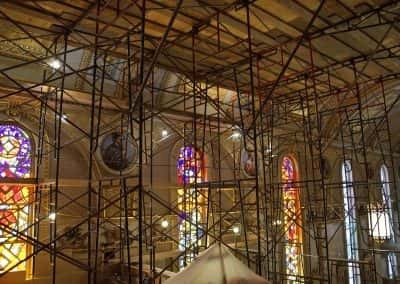 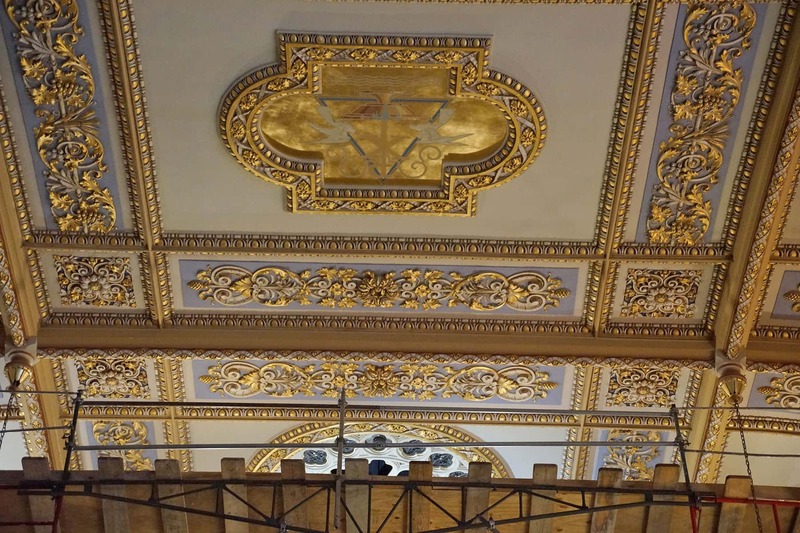 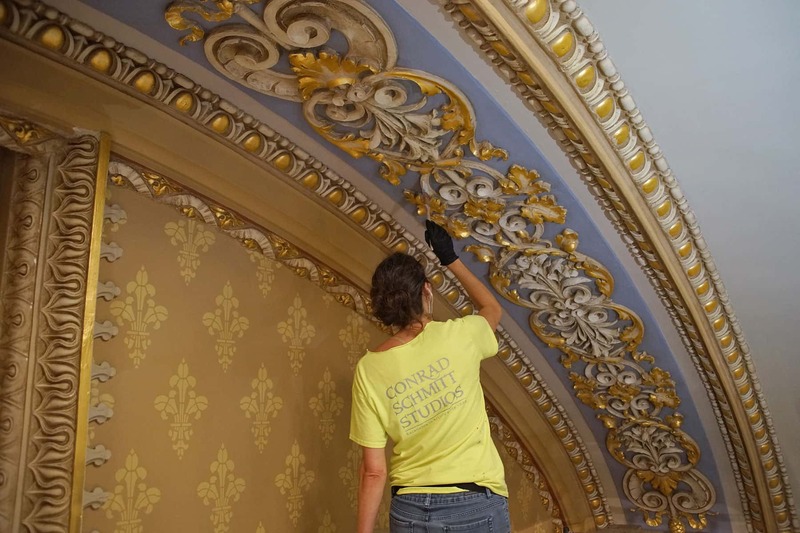 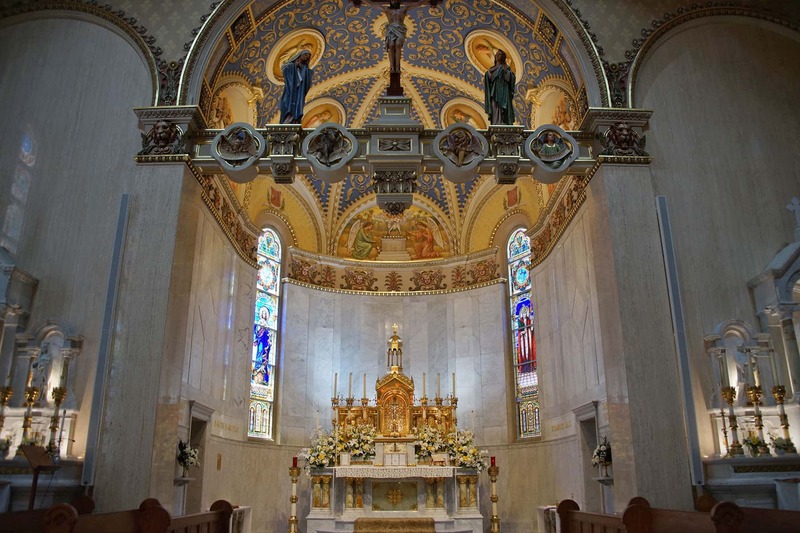 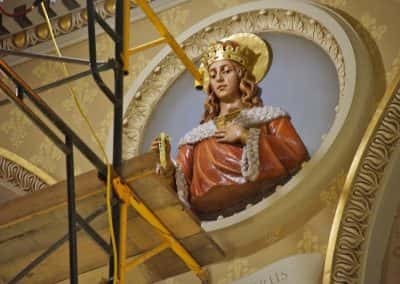 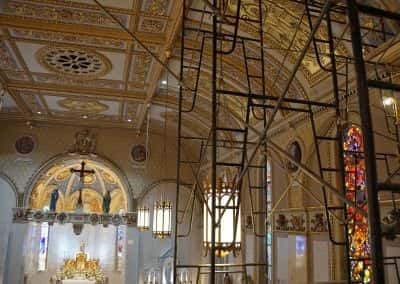 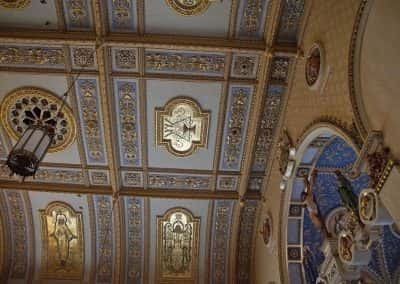 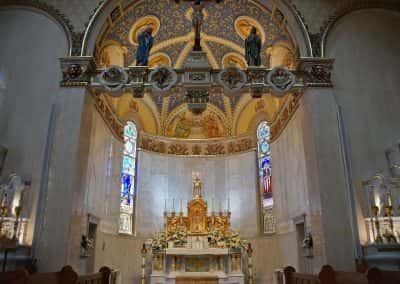 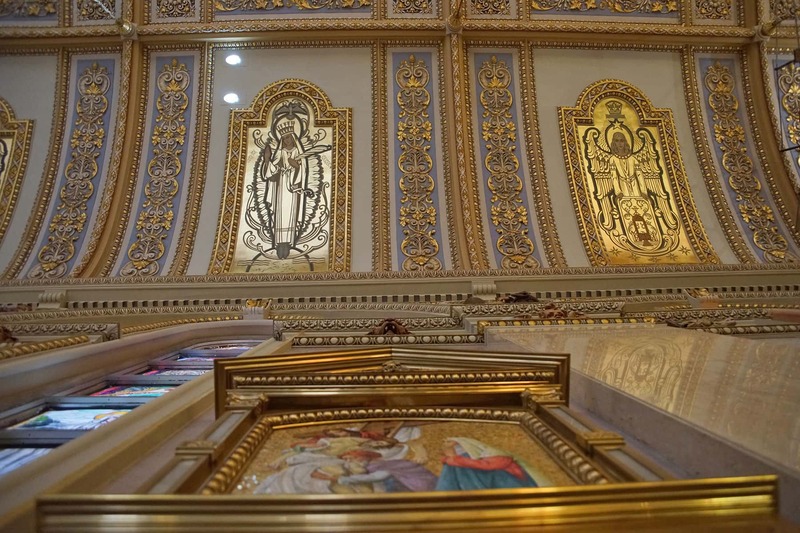 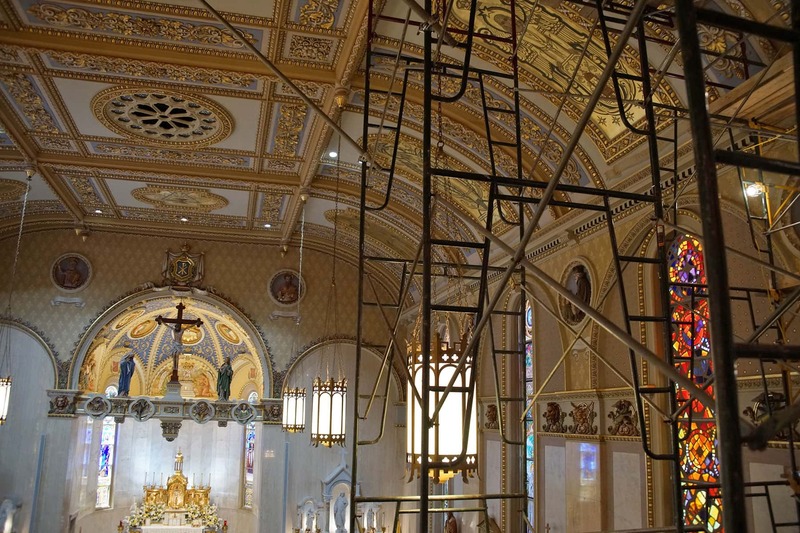 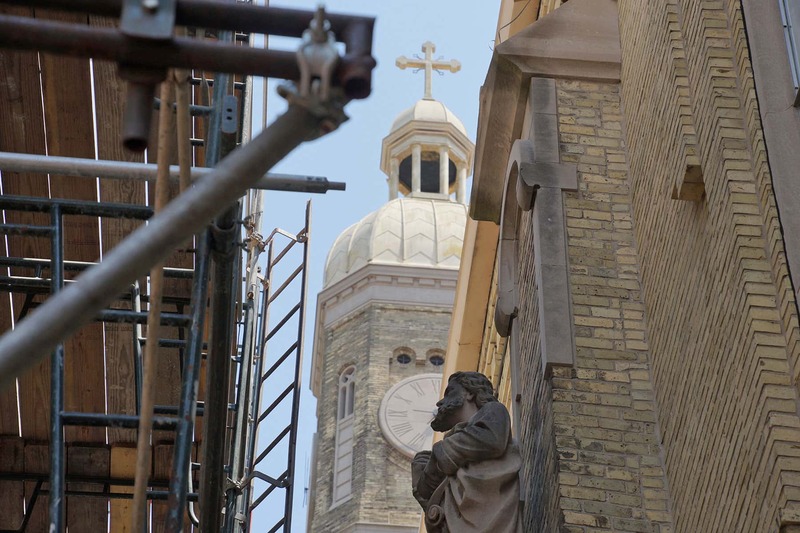 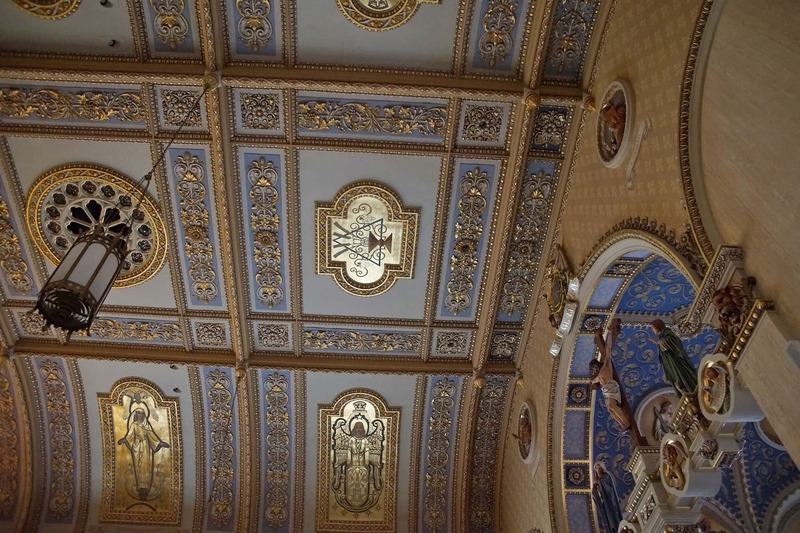 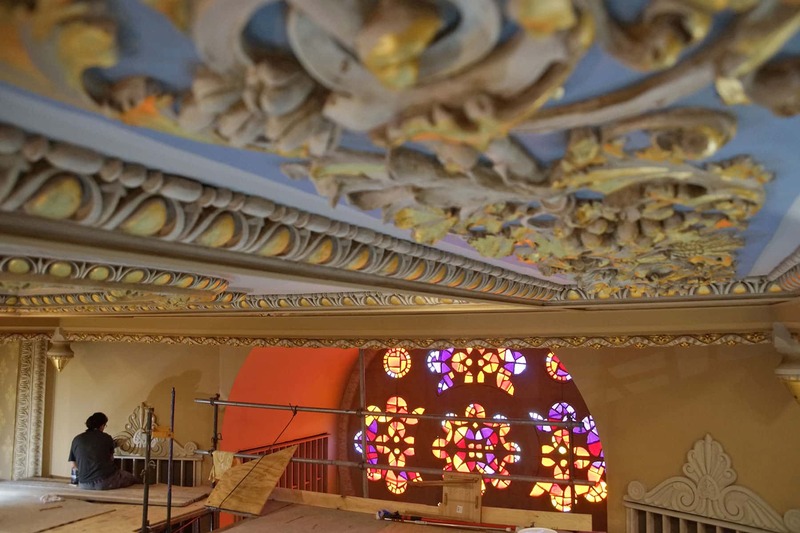 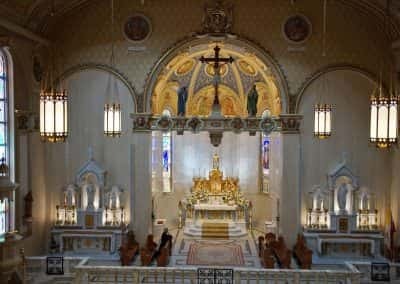 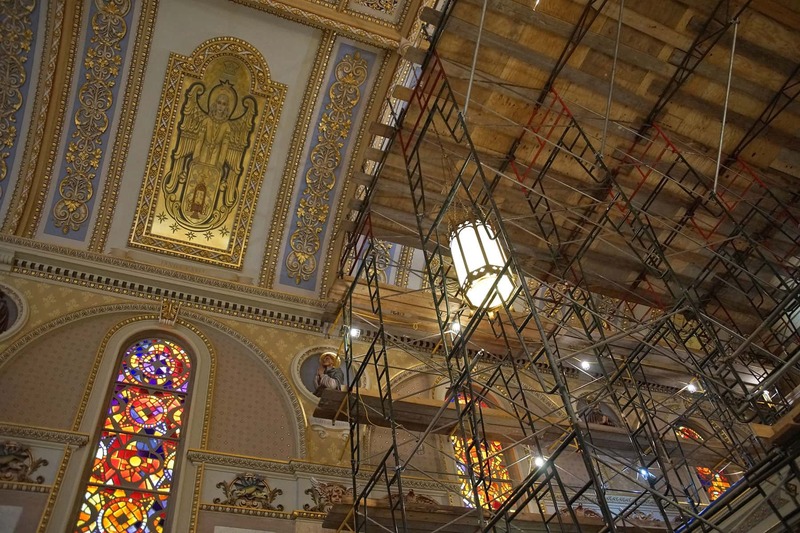 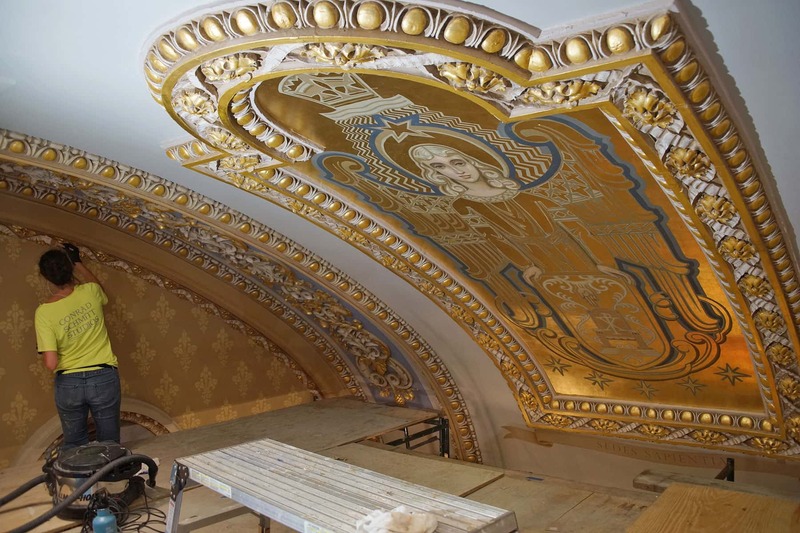 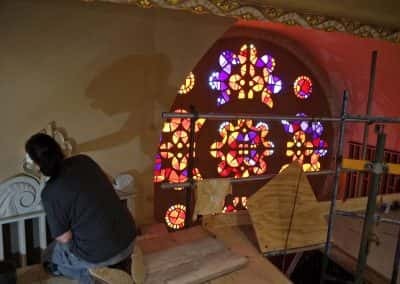 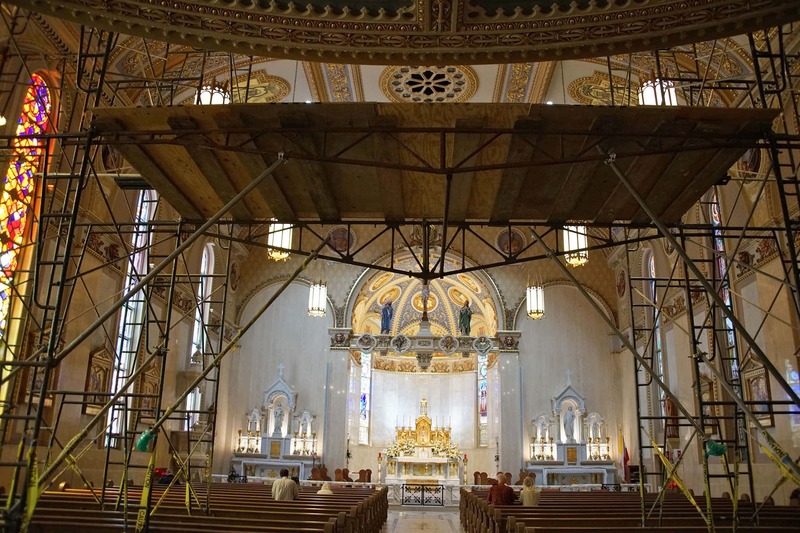 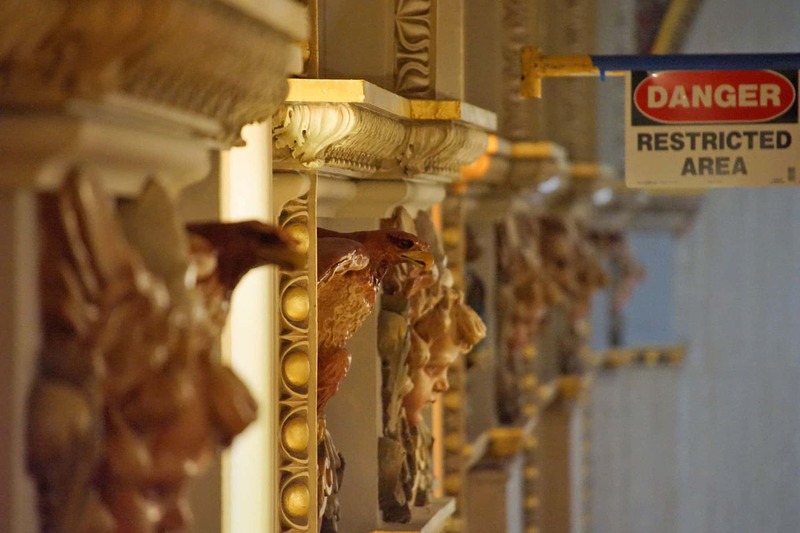 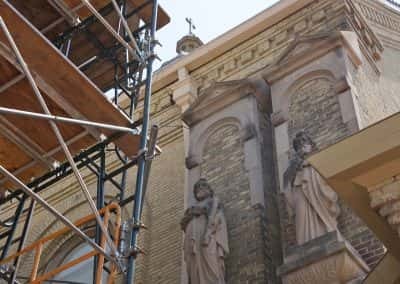 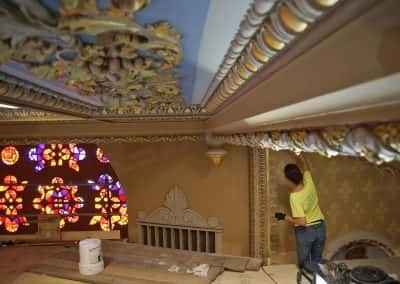 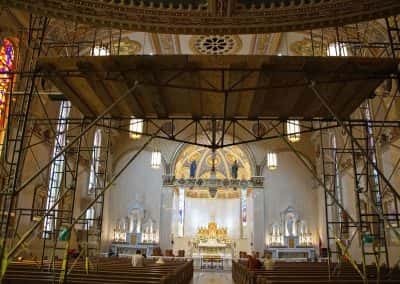 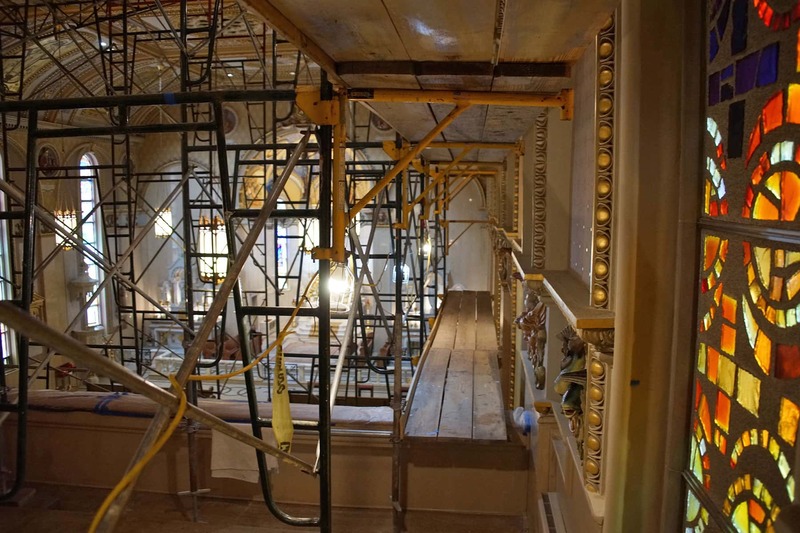 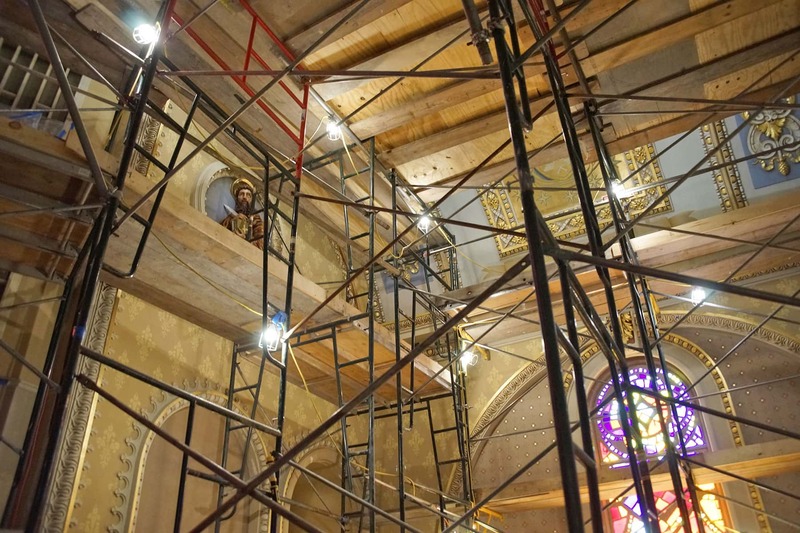 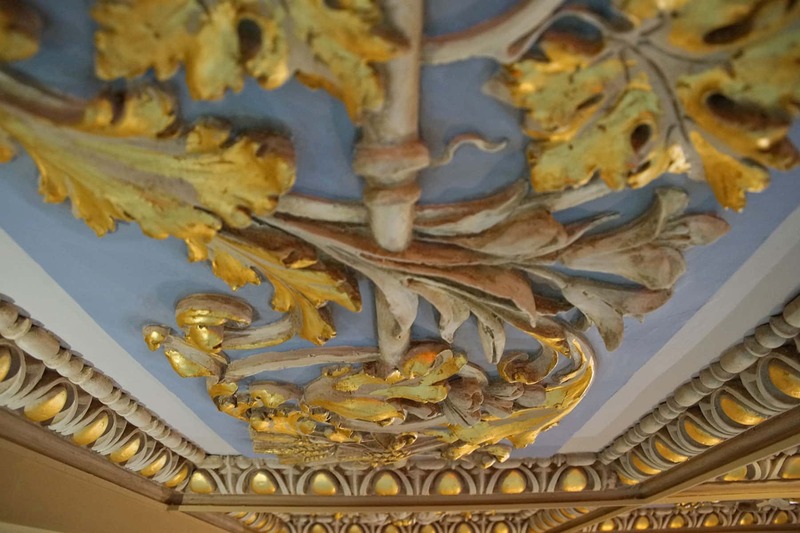 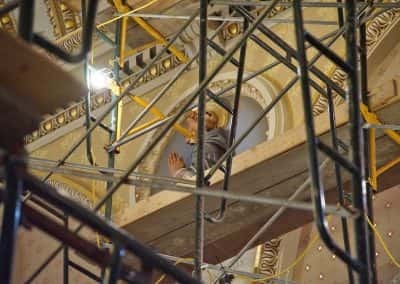 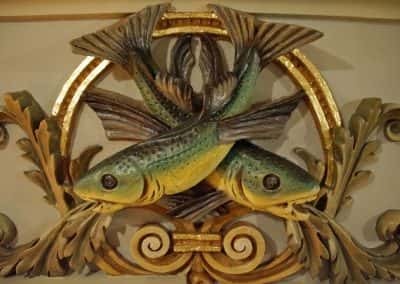 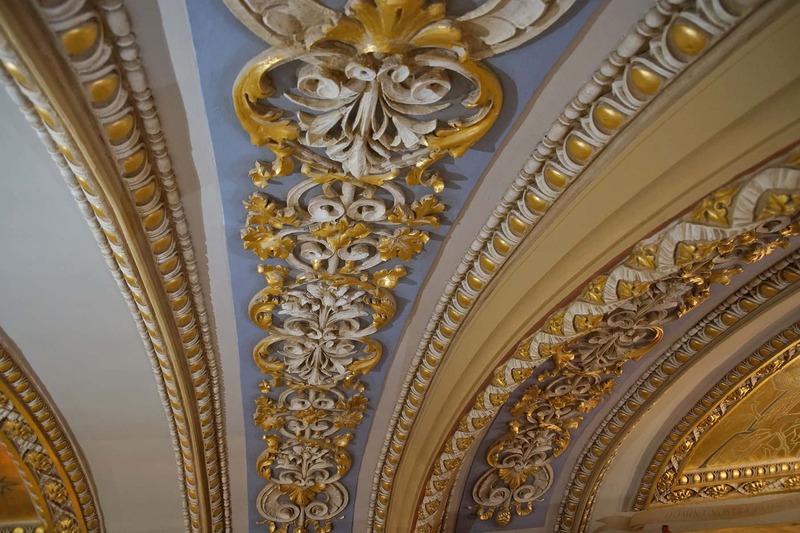 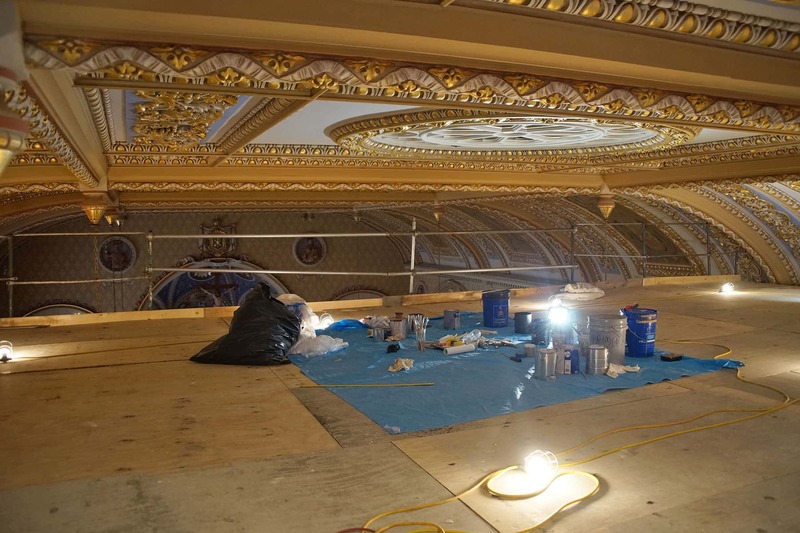 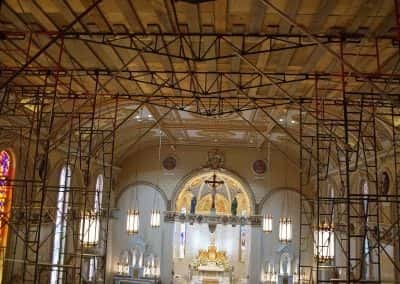 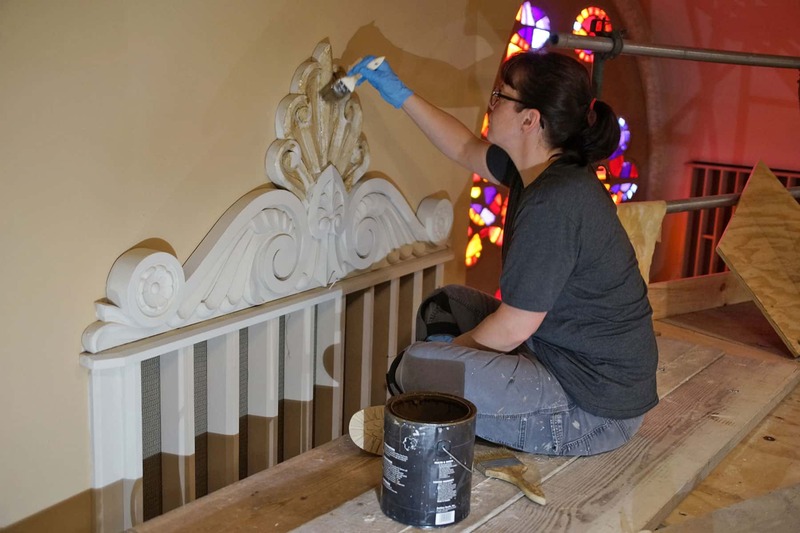 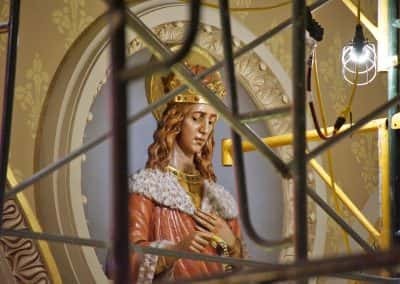 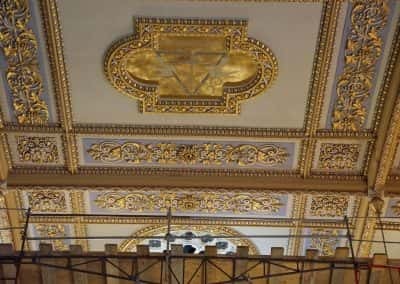 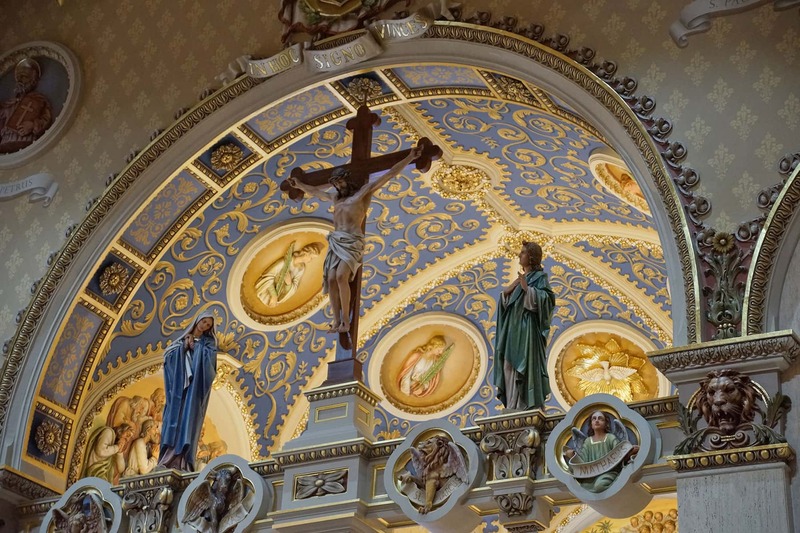 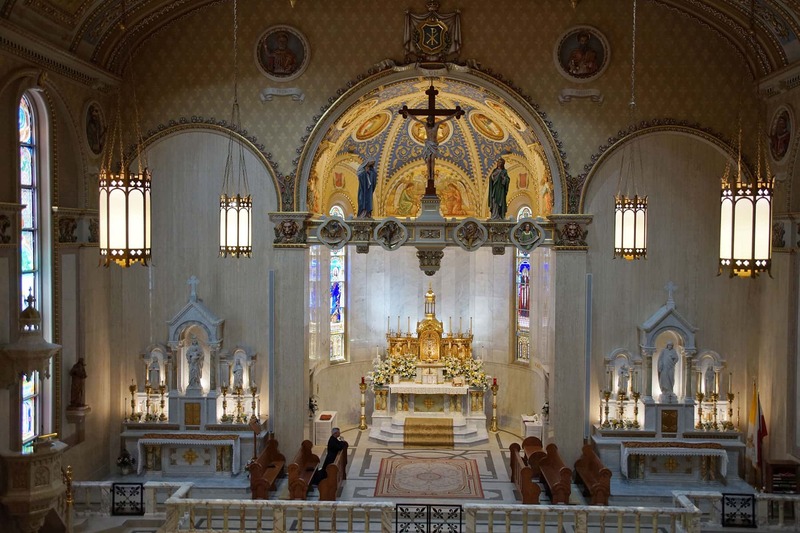 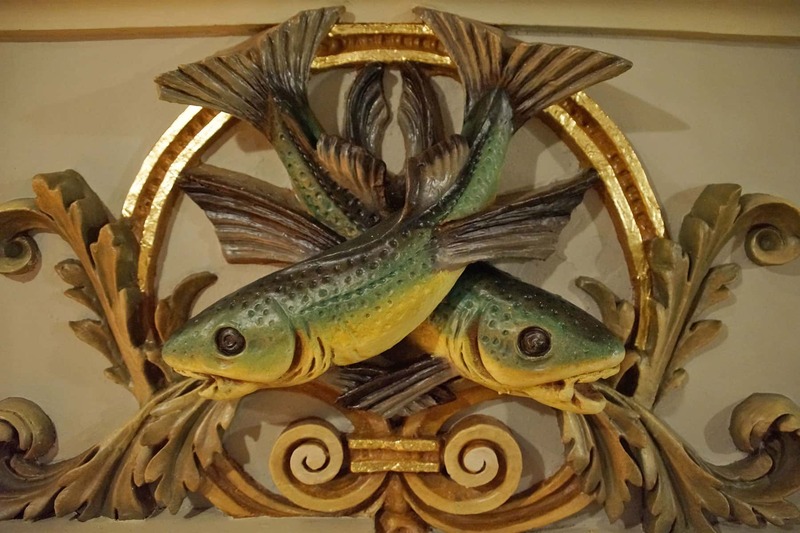 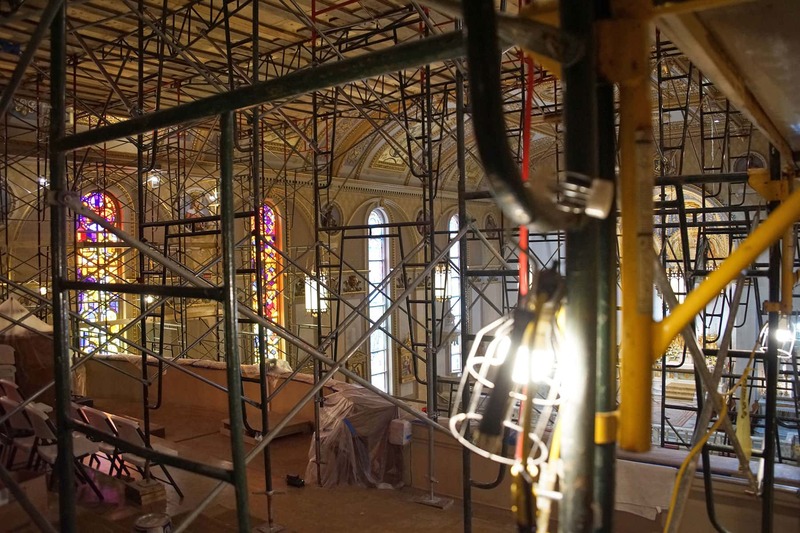 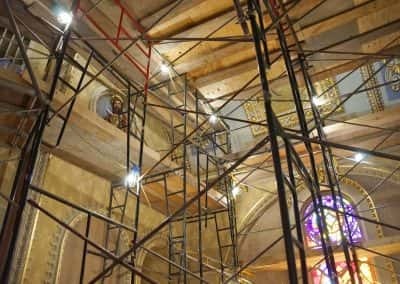 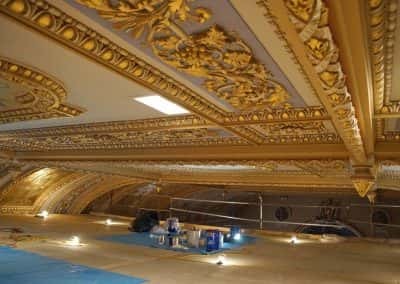 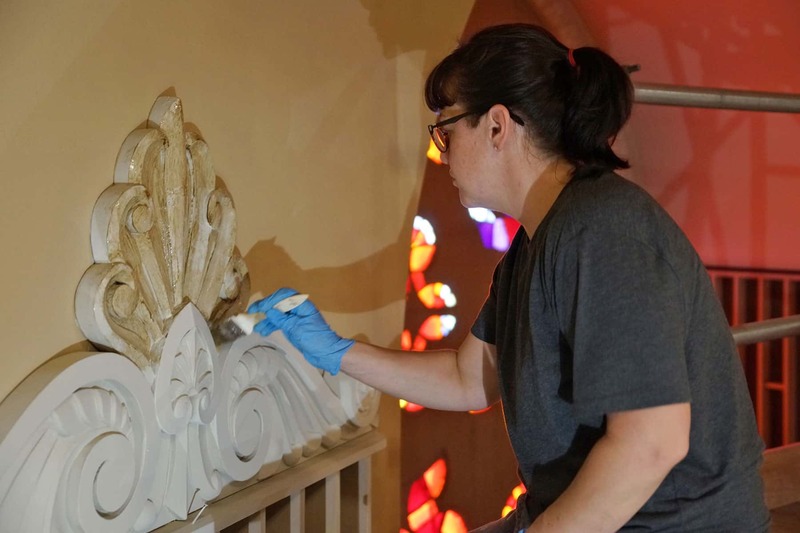 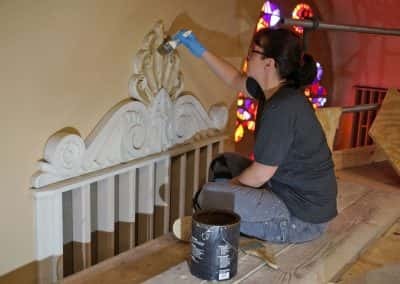 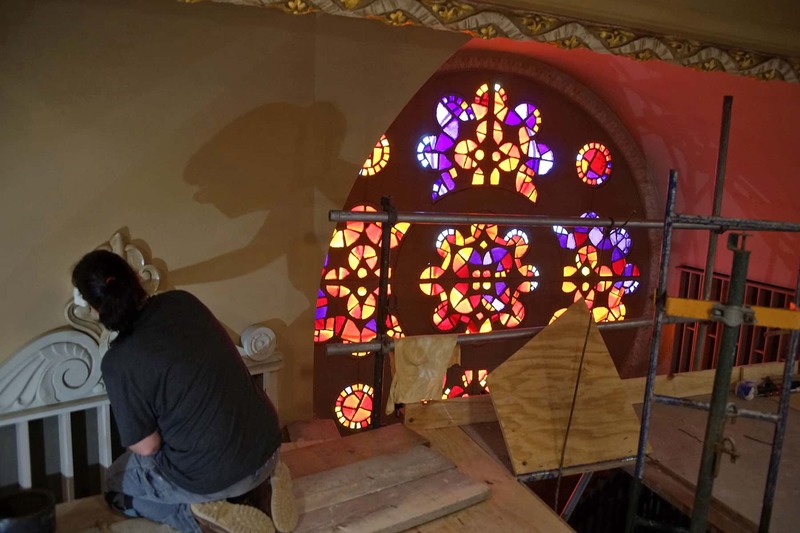 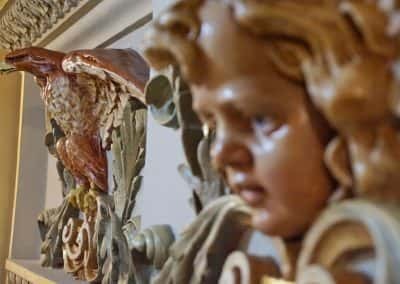 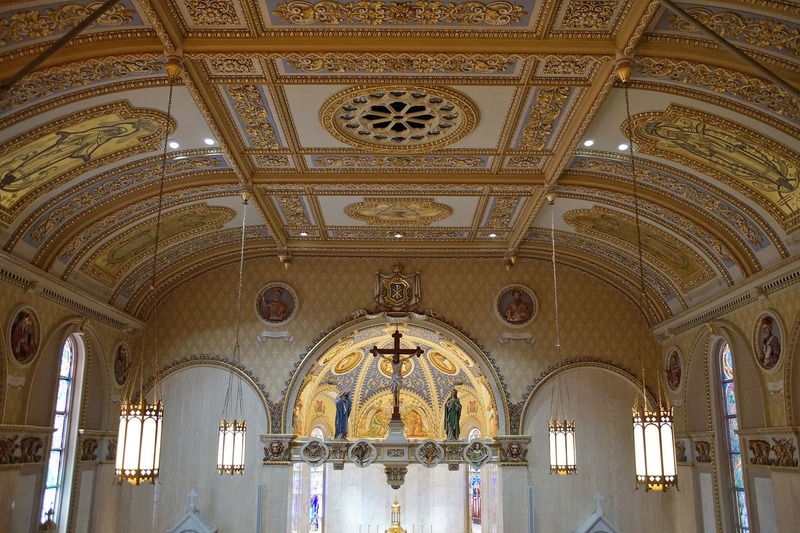 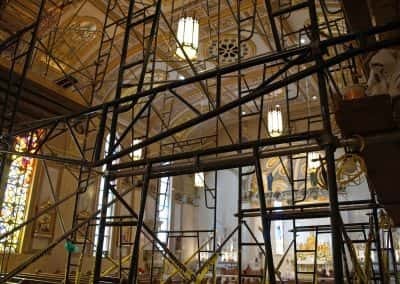 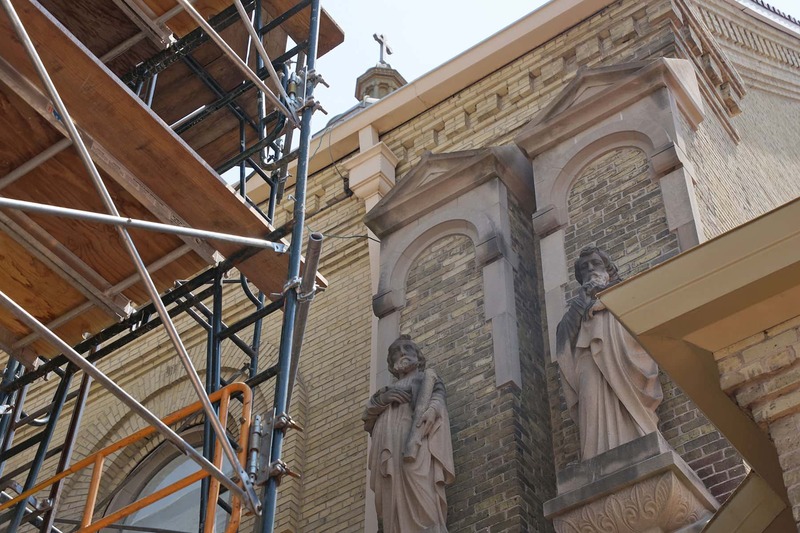 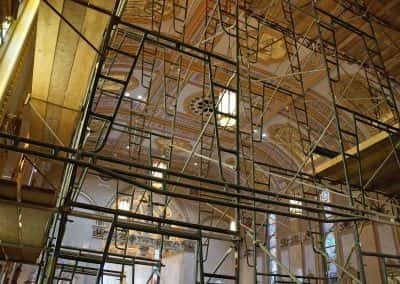 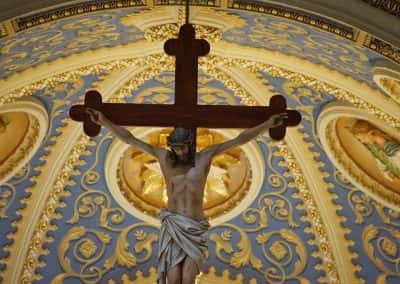 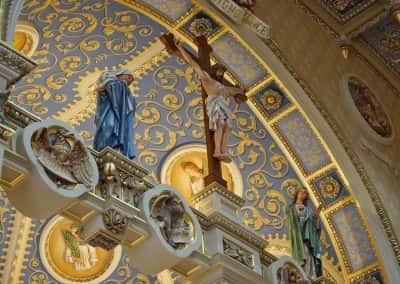 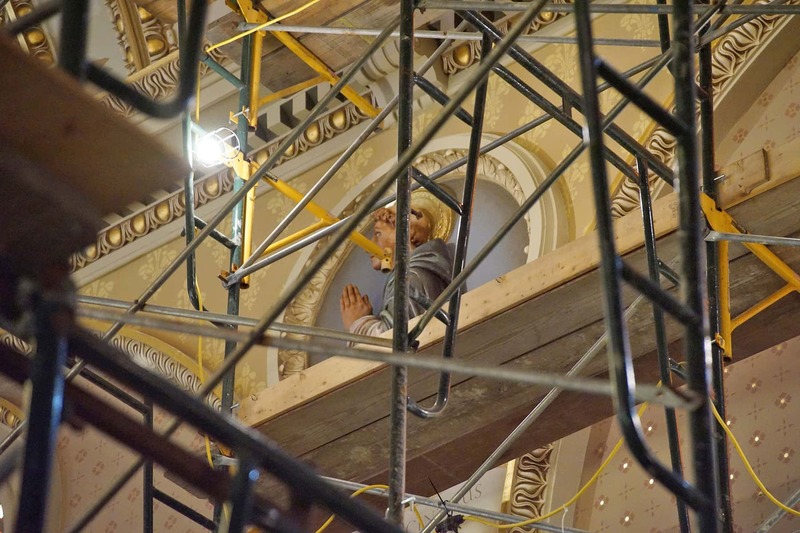 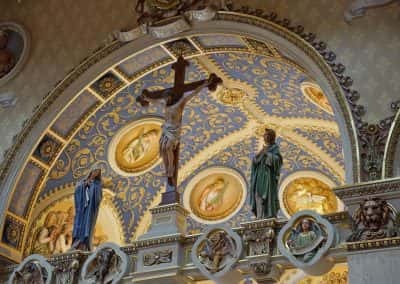 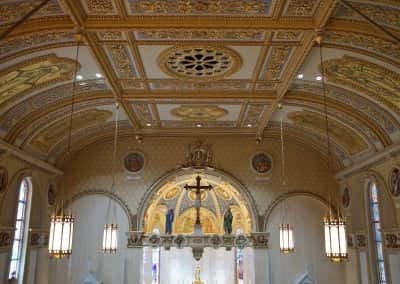 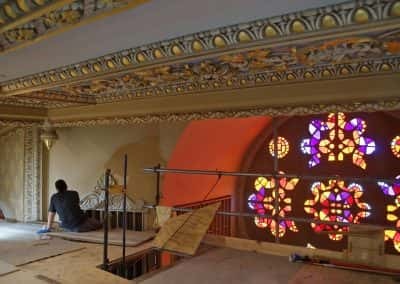 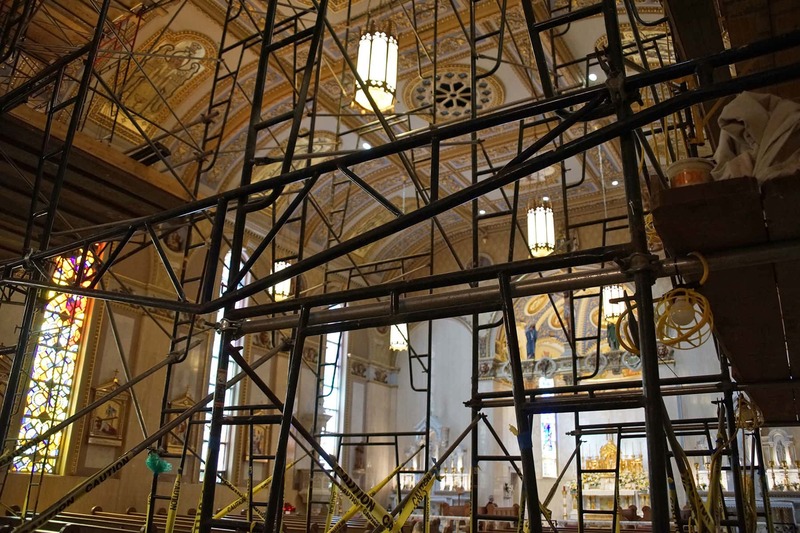 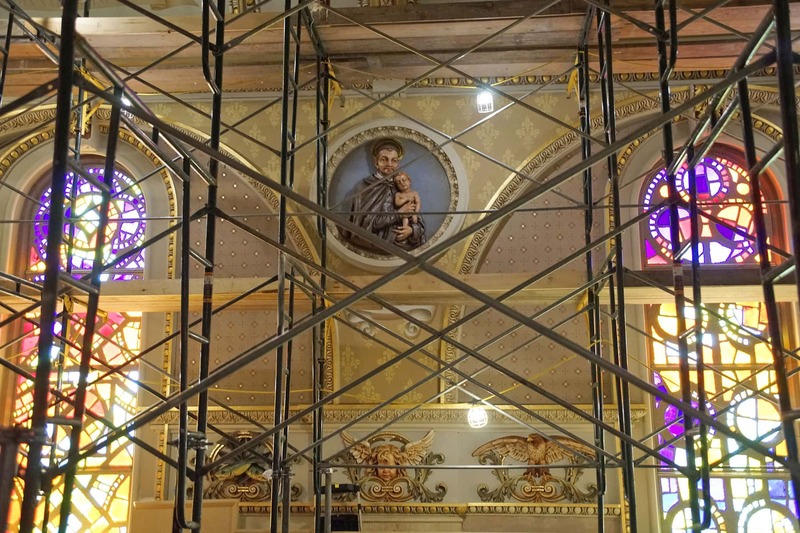 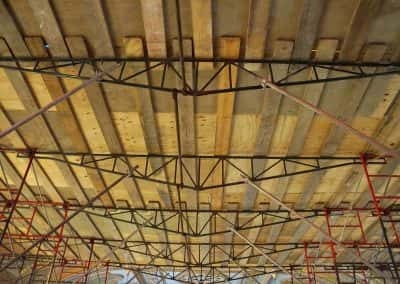 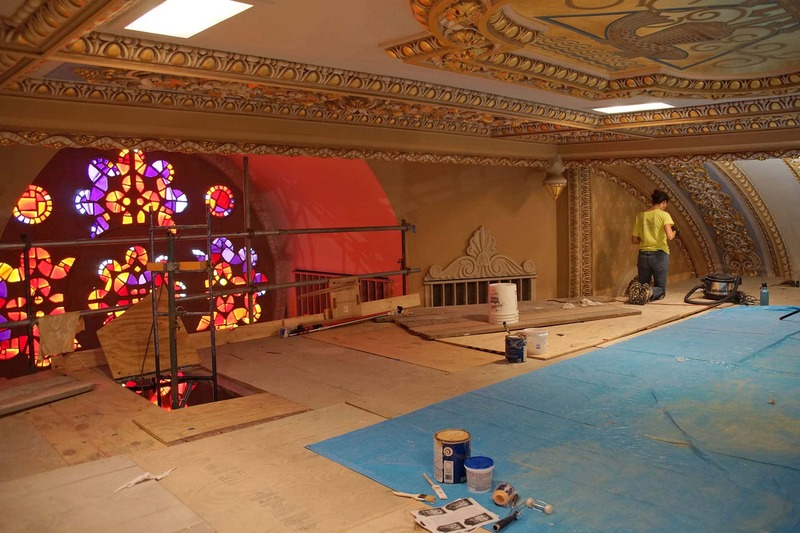 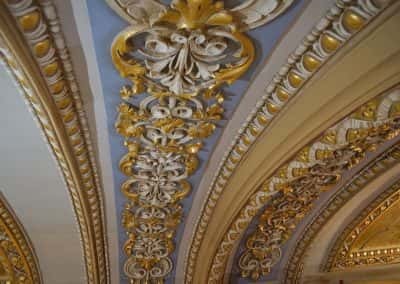 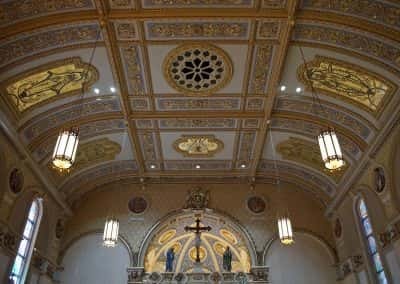 These images highlight some of the work-in-progress at St. Stanislaus by Conrad Schmitt Studios, while artists labored to revive the elaborate and ornate features of the expansive ceiling.